OFFICIAL ACTIONS: Torreya taxifolia was declared "endangered" under the USA Endangered Species Act in 1984. Within its native range (a peak glacial refuge in northern Florida) seed production had virtually ceased several decades before listing. Therefore, a crucial first action was for professionals to collect branchlets onsite from all the remaining wild trees and then to root those samples in misting facilities of several northward botanical gardens. STEP 1 of the official recovery program, "genetic safeguarding," was very successful. 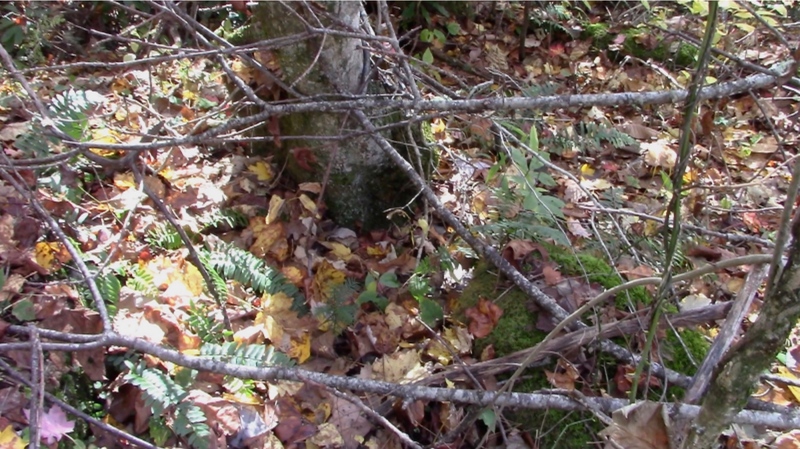 "Ex situ" plantings" of a diversity of sexually mature shrubby specimens grown from rooted branchlets constituted the second phase of recovery action. Sites in northern Georgia (geographically, the southernmost extent of the Appalachian Mountains) were selected for the out-plantings. Although ex situ seed production from 2007 through 2017 was officially undocumented and uncollected, observers have noticed that the pair of ex situ "orchards" had been producing hundreds and, since 2013, thousands of seeds annually. STEP 2, "ex situ plantings" (for both genetic safeguarding and seed production), has thus been successful, too. 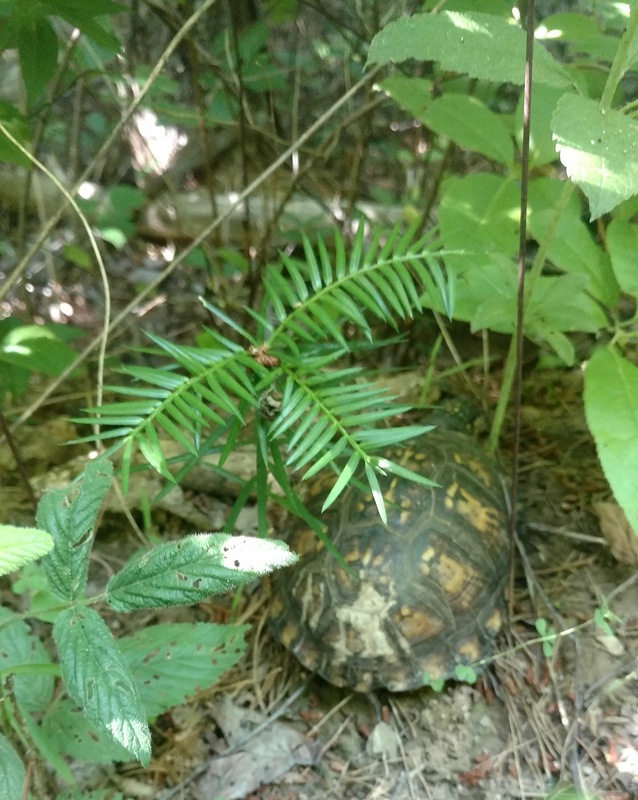 VOLUNTEER ACTIONS: Meanwhile, since 2005, TORREYA GUARDIANS volunteers have engaged in a variety of independent projects aiming toward recovery of this climate-endangered conifer tree  mostly via "assisted migration" northward. Planting projects have been testing the climate and habitat suitability of northward sites (see map below). Northward experimentation depended on acquiring potted seedlings from nurseries and, increasingly, receiving donations of seeds from privately owned mature trees (see map below). Seeds have been sourced in North Carolina (Biltmore Gardens near Asheville, Harbison House near Highlands, the Kennedy home in Clinton, and the A. J. Bullard home in Mt. Olive). Beginning in 2018, Briarwood Preserve became another source, as did the 11-year-old grove of our Cleveland OH planter, Fred Bess. Documentation and interpretation of all seed-producing groves is a noteworthy contribution made by Torreya Guardians toward species recovery. 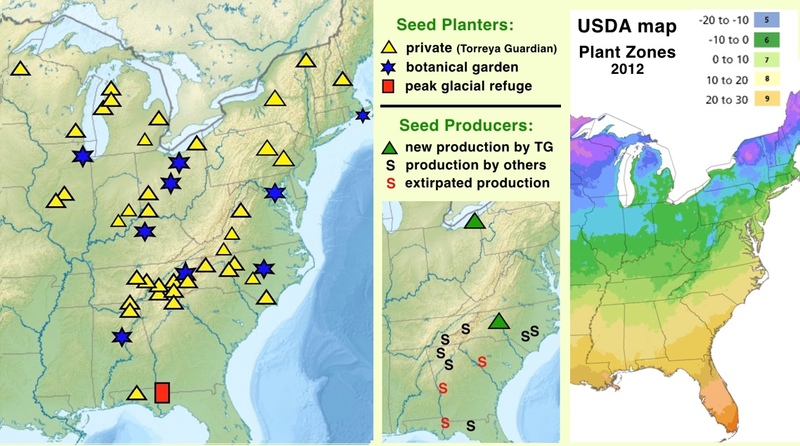 Evidence of climate and habitat suitability of these long-established northward plantings offer encouragement for managers to undertake "assisted migration" as STEP 3 of the official program. Toward this end, a photo-rich compilation of these Historic Groves was added to this website in 2018. 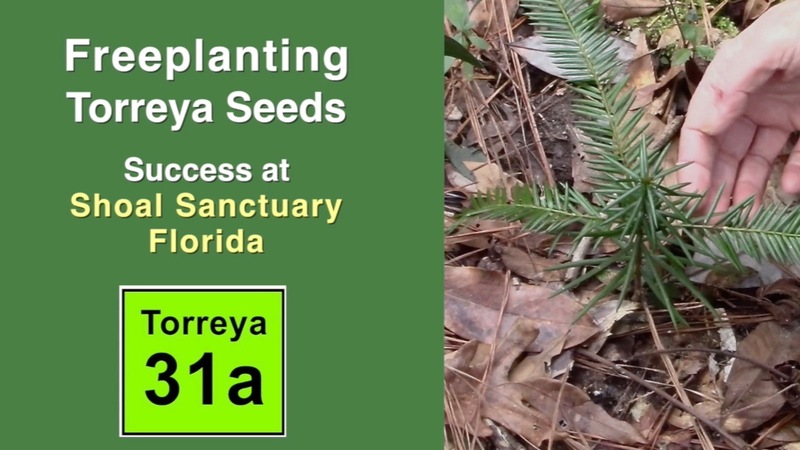 Torreya has demonstrated in these historic groves its ability to thrive, produce seeds, and establish seedlings naturally in northward latitudes  while remaining noninvasive. 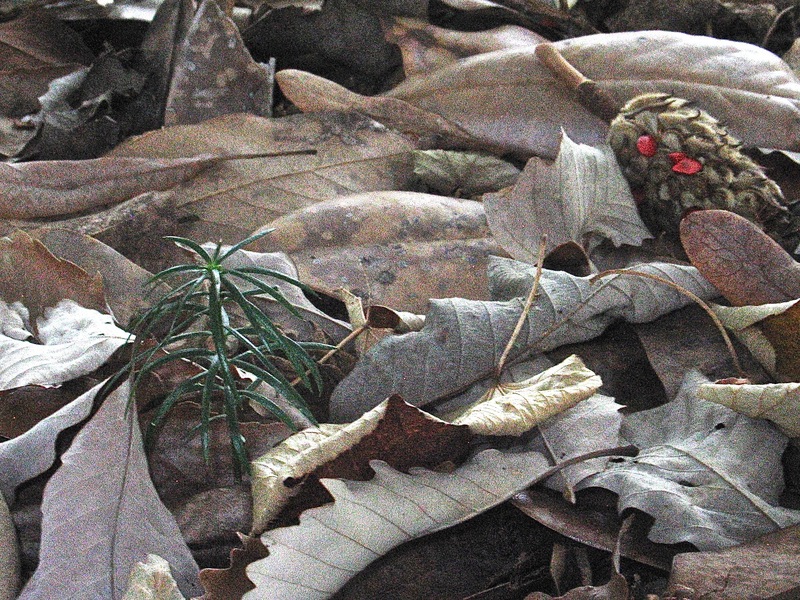 Seeds produced in the official ex situ groves in northern Georgia (Smithgall Woods and Blairsville) have become numerous enough to merit an official declaration of "nonessential." 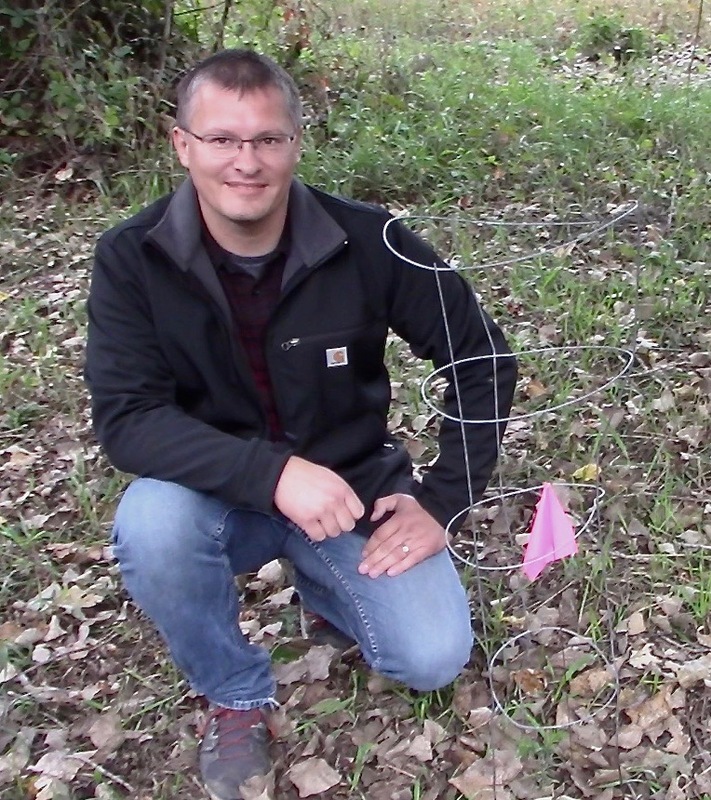 Such declaration would then make seeds available for a next phase of official field experimentation, STEP 4: "free-planting" seeds directly into selected northward forested sites. Given governmental budgetary constraints, it is unlikely that full recovery and delisting of Torreya taxifolia can be accomplished in labor-intensive and costly ways (e.g., producing potted seedlings and later transporting them to and planting them in ultimate destinations). Accordingly, it is vital to ascertain best practices for safely, yet inexpensively, introducing seeds directly into forest habitats  without first germinating them in protected settings (such as wire-protected soil beds or pots in botanical gardens). 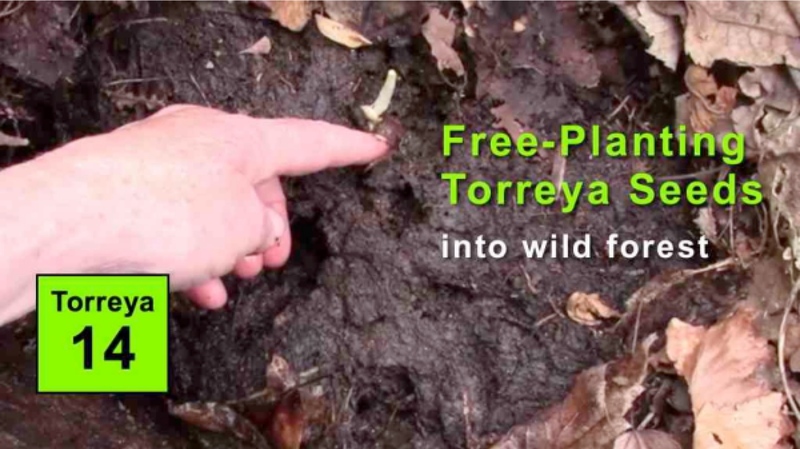 Since 2013, a growing number of Torreya Guardians have been legally experimenting (beyond the constraints of the governmentally sanctioned recovery plan, which will be updated in 2019) with techniques for skipping the potted seedling step in torreya propagation. Instead, harvested seeds are being put directly into forest habitats as their ultimate destinations. 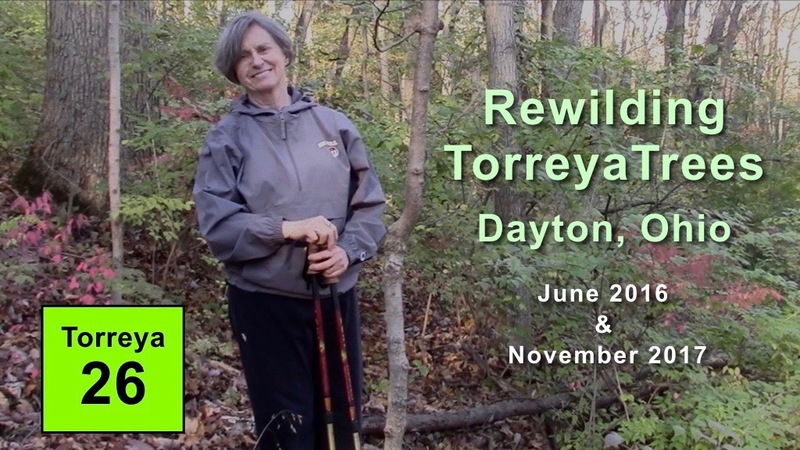 Torreya Guardians founder Connie Barlow has been the chief proponent of free-planting experiments and has been photo- and video-documenting ongoing results. 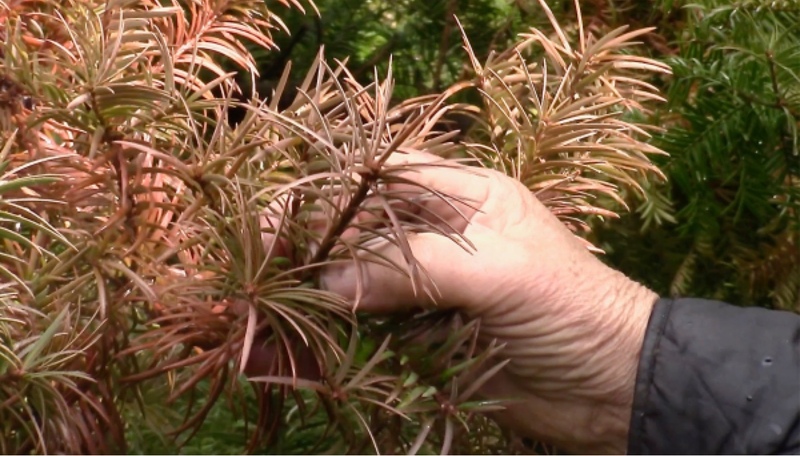 This page (established December 2018) posts the highlights of ongoing free-planting experiments by Torreya Gaurdians. Learnings will be offered, while inviting others to join in interpreting the ever-expanding field evidence. 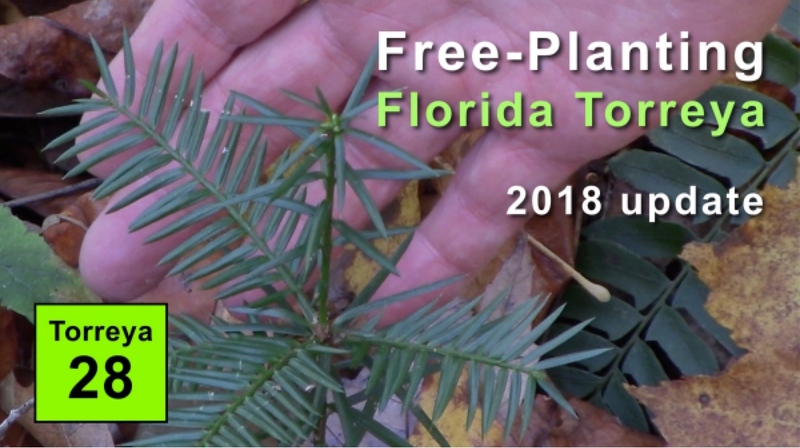 Note: The Federal Register August 2018 notice that Florida Torreya's recovery plan will be open to updating is the event that compelled Barlow to establish this photo-rich webpage of summary results. 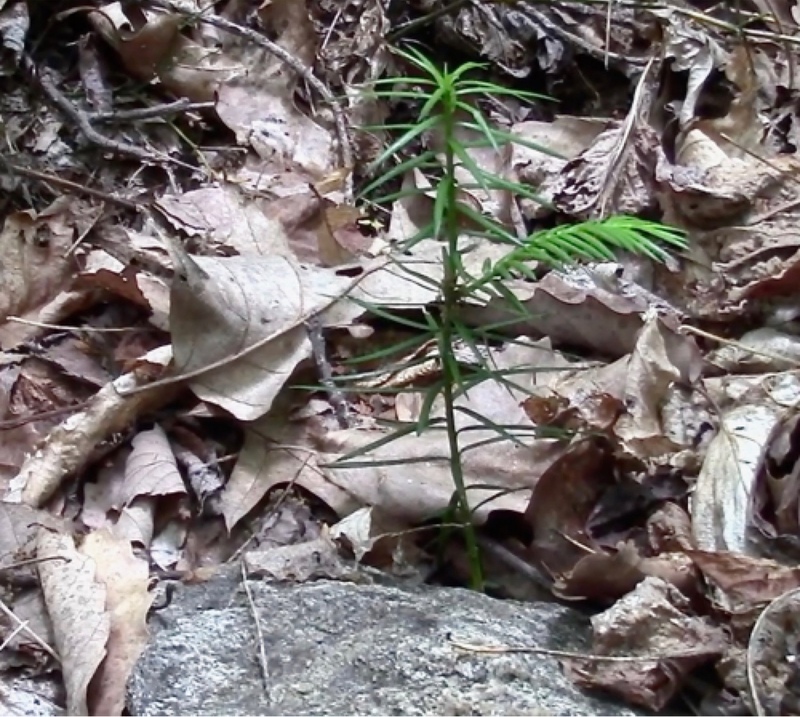 Field documentation of the 6 seedlings that grew and survived with zero human help, following "free-planting" of 15 seeds directly into forest soil in April 2015. 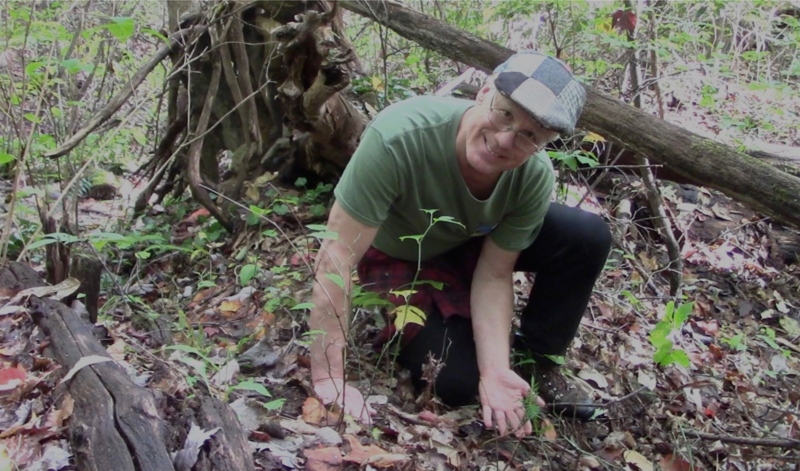 Russ Regnery was the planter, within his forest at 3,800 feet elevation on the slope of Black Rock Mountain, near Franklin NC. 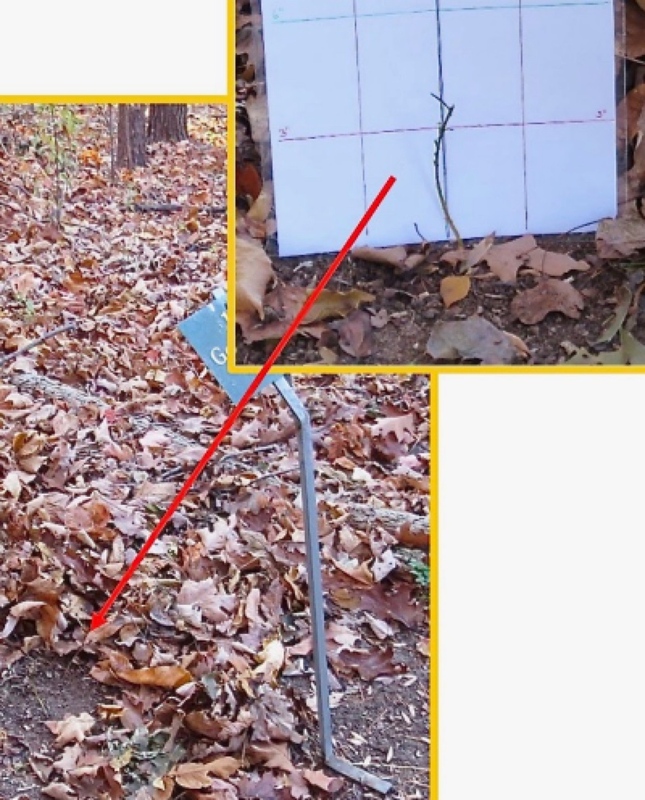 Video clips of the 2015 planting (Episode 12) are matched with the actual seedlings closely photographed and analyzed Nov 2018. 1. GERMINATION FAILURE owing to poor pollination, premature seed harvest, improper handling, or overlong delays before planting. However, potted seeds bear the same risks. 1. TAPROOT IS FREE TO GROW. 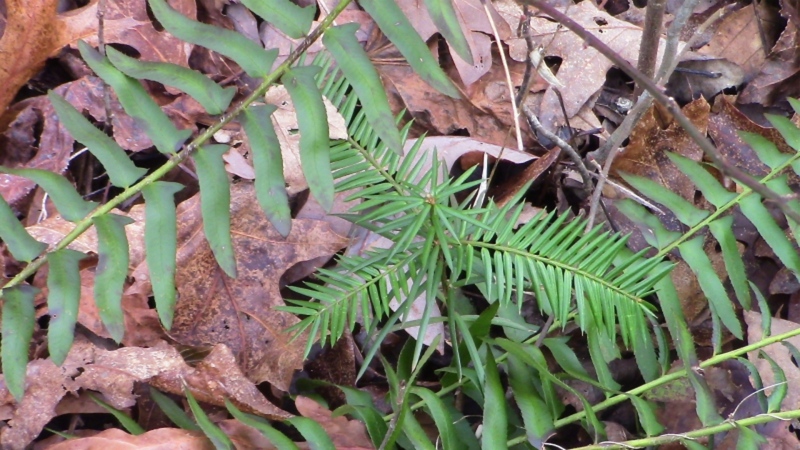 Genus Torreya has a taproot. 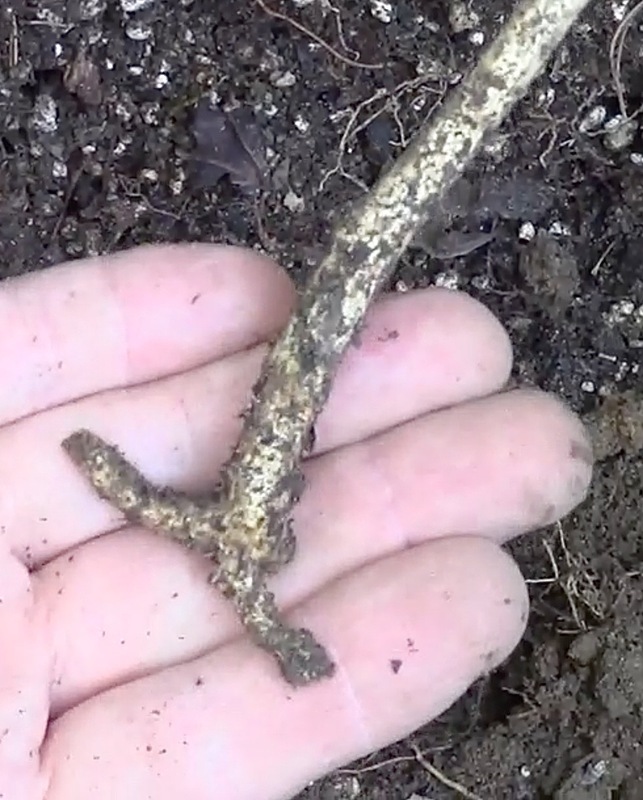 It is generally recognized that taprooted species can be temporarily (possibly permanently) set back if the taproot has to stop growth at the bottom of a planting pot. Indeed, overlong constriction in a pot can be damaging to the configuration of roots of any species. 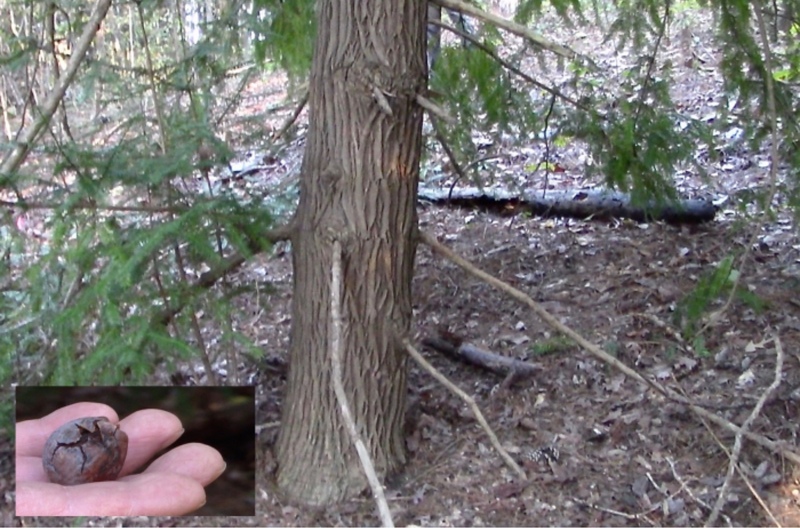 Free-planting directly into its ultimate forest location prevents malformation of roots. 2. IDEAL FOR MYCORRHIZAL ESTABLISHMENT. 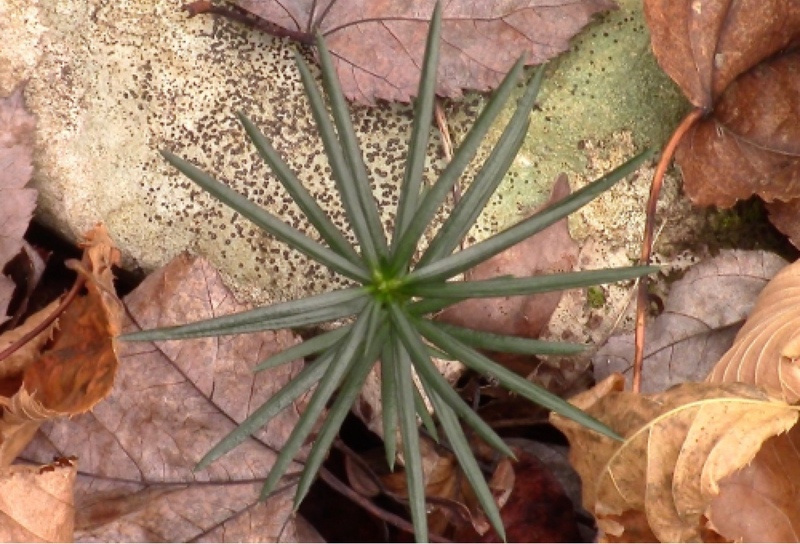 Especially if attention is paid to planting seeds in healthy forest soil (and near plant species that partner with the same class of endomycorrhizal fungal symbionts (VAM); see species list), ideal conditions for overall health may be accessed. 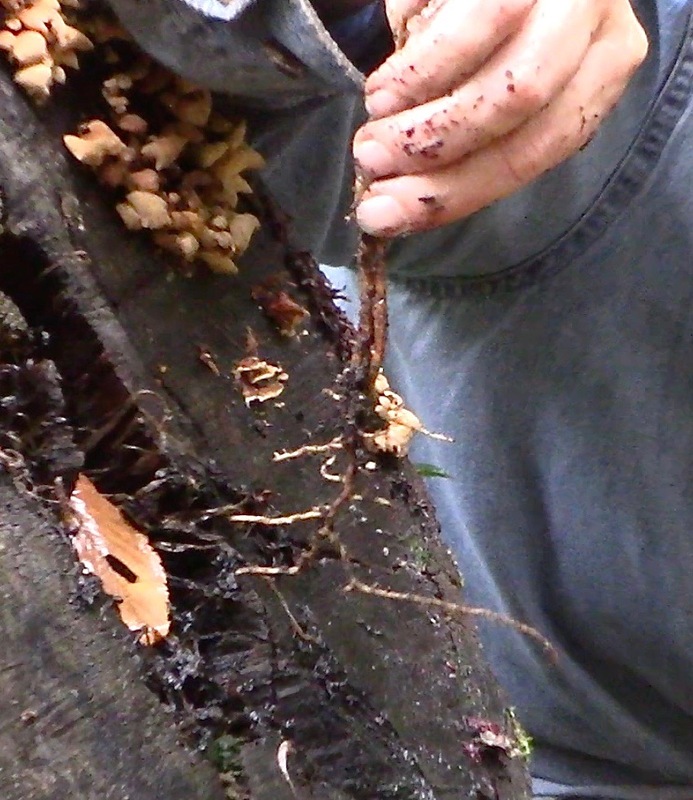 Indeed, as more is learned about the "wood-wide web" of tree roots + fungal networks, it is possible that not only minerals will be delivered to the growing seedling but also sugars from canopy-level neighbors. 3. AVOIDANCE OF OUT-PLANTING ROOT INJURY. Replanting of seedlings nurtured in pots (either to larger pots or eventually to forest soil) can set back or permanently injure ultimate root development. 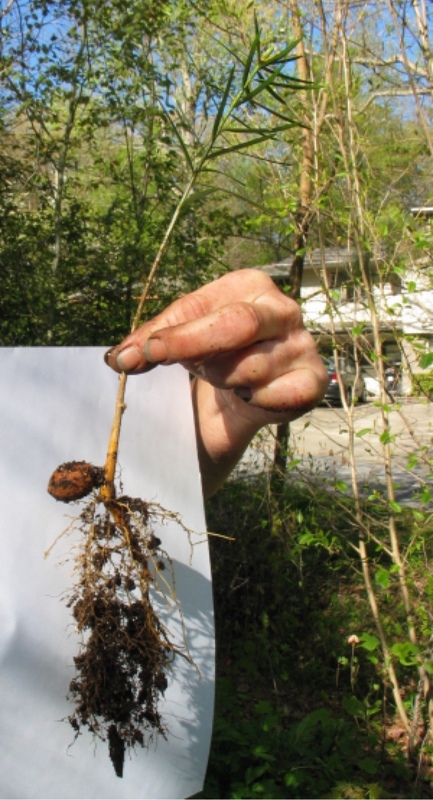 Torreya bears a taproot and can easily become "rootbound." Successfully replanting this species from potted seedlings requires great care and a commitment to outplant seedlings while the roots are still in good health. ABOVE LEFT: Janet Manning (head gardener, Corneille Bryan Native Garden, Lake Junaluska NC) just extracted this fresh seedling from a wire-protected, outdoor germination bed in which the roots are free to venture deep. This was a fall 2010 harvested seed that grew its above-ground stem in late summer 2012. The photo was taken April 2013 by Connie Barlow. Notice the seed is still attached (and is likely still nourishing the seedling). ABOVE CENTER: Potting soil was easy to shake off from this specimen. However, after 5 years in the pot, this Torreya had given up on sending a taproot downward. (October 2018, Connie Barlow). 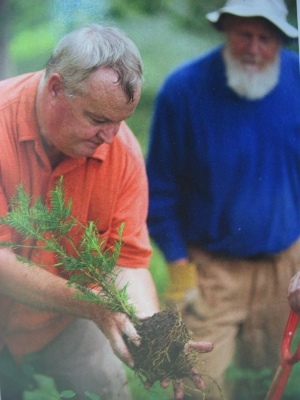 ABOVE RIGHT: Lee Barnes and Russ Regnery planting 1 of the 31 potted seedlings placed at Lake Junaluska and Waynesville during the first planting action by Torreya Guardians, July 2008. Notice that the seedling had grown far too large for its little pot. 4. NO DANGER OF POTTING SOIL OR MULCH ATTRACTING BURROWING RODENTS. 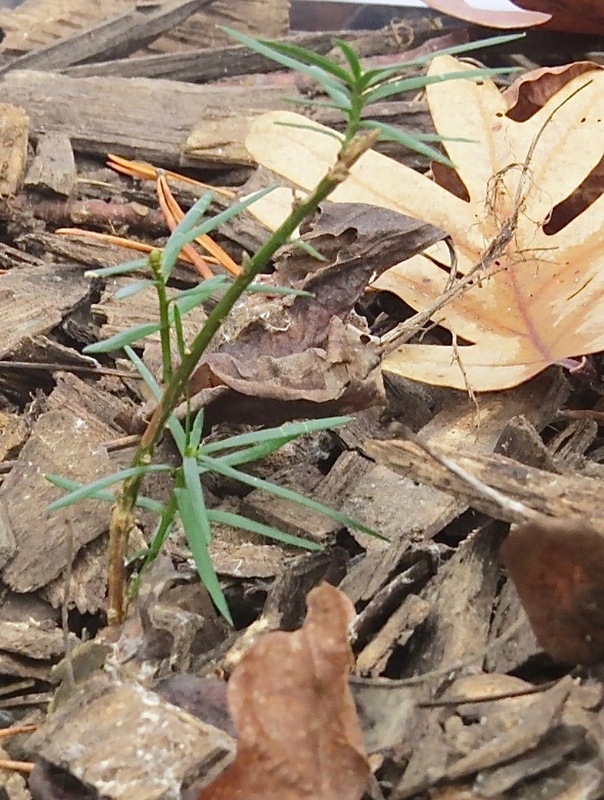 Even several years after growing in forest soil, Torreya seedlings outplanted from pots are apparently still vulnerable to sudden death by tunneling rodents (especially over winter). 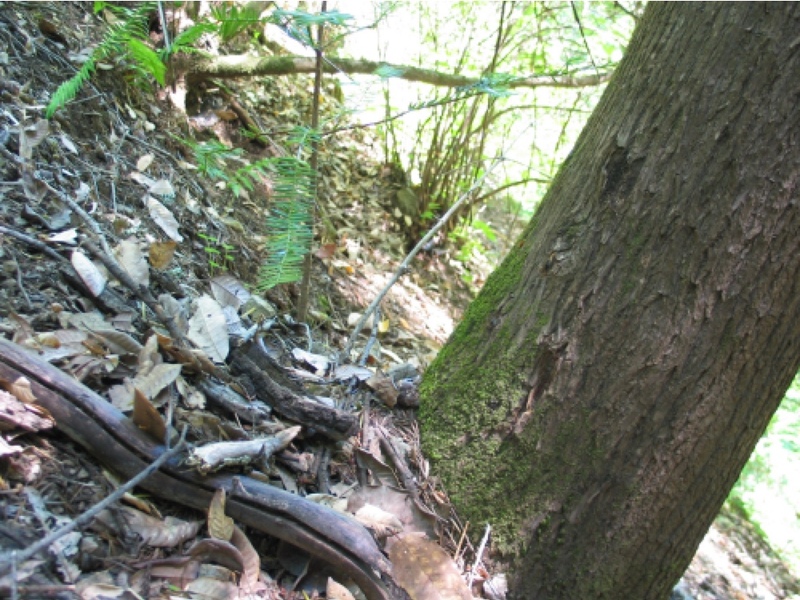 At two North Carolina sites of Torreya Guardian plantings (Brevard and Lake Junaluska), below-ground bark had been stripped off and roots gnawed through in the upper soil layer (presumably for cambium food value). 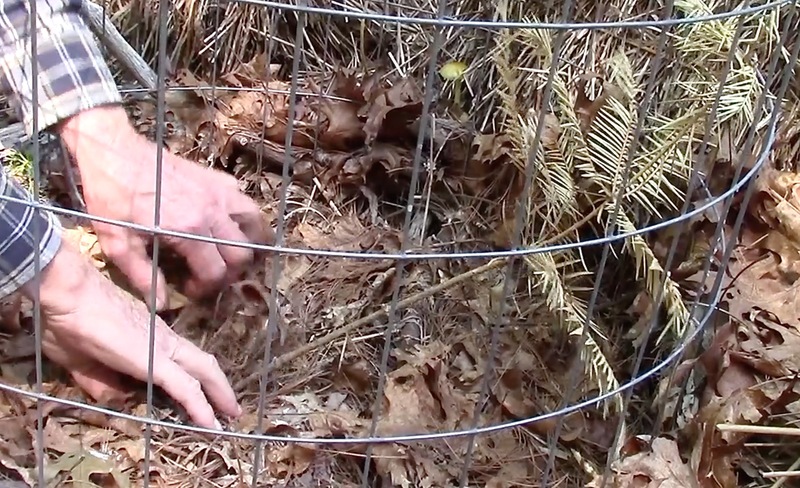 Wire cages protecting lower stems do not protect against below-ground gnawing. Supreme care must therefore be taken to ensure that the soil (or mulch) conditions when outplanting from a pot are no more attractive (ie., less dense) than the surrounding forest soil. Our recommendations for outplanting potted seedlings now include (a) shake off all perlite/potting soil, (b) possibly add gravel to make the root surrounds even less attractive for tunnel building, and (c) ensure that the overlay of leaves is the same as the immediate surrounds. The depth technique of free-planting avoids these perils. 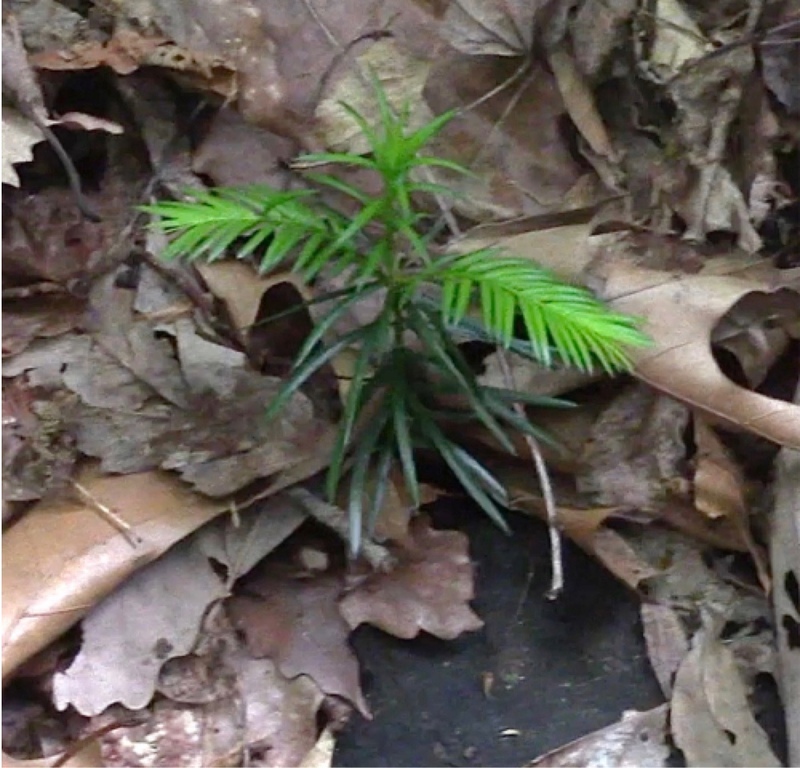 PHOTOS ABOVE: Spring 2016 Connie Barlow video-recorded the sudden, over-winter death by a burrowing rodent of a potted torreya that had been outplanted the previous year. Posted on youtube is a video of our postmortem investigation. PHOTO BELOW was taken in Spring 2016 by Connie Barlow at the Corneille Bryan Native Garden (Junaluska) site near Waynesville NC. That was where Torreya Guardians planted 10 potted seedlings in July 2008. We found the plant (and its above-ground metal cage) lying on its side. 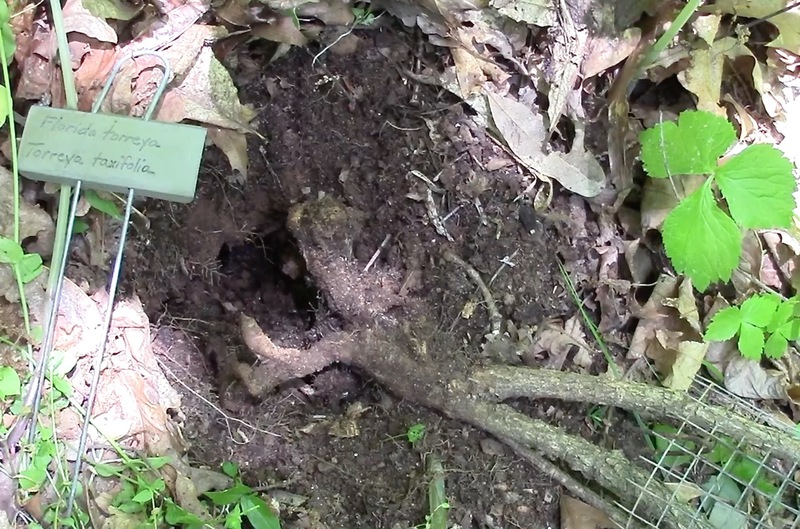 The perlite-infused soil was easy digging  and we immediately unearthed a chipmunk-size rodent tunnel and rodent-gnawed roots (visible in the photo). At this same site, 3 Torreyas had been killed by rodents their first winter. All 5 deaths are in the plantings closest to a bird feeder at a seasonally occupied home (boom and bust rodent population?). Watch details via a video posted on youtube. 5. LEAVES ADAPTED FOR PRECISE LIGHT CONDITIONS. 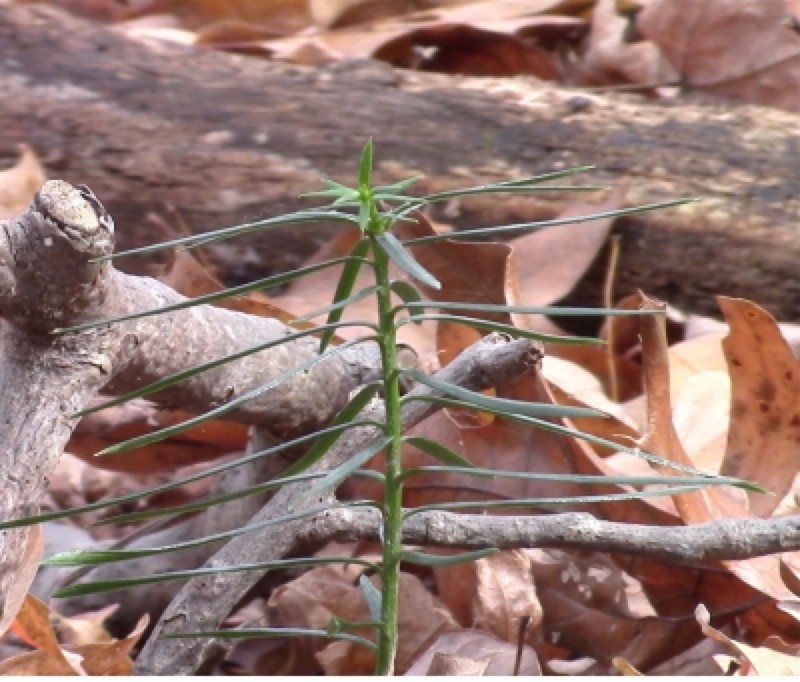 A number of Torreya Guardians have discovered that planting potted seedlings into substantially different light conditions from where they had been growing stresses the new plantings  whose evergreen leaves will remain in place for at least 5 years before falling away. In contrast, only a tree-fall will challenge a free-planted torreya to cope with several years of difficulty before new leaves and branchlets grow with UV protection and ideal length and orientation. 1. SEED HARVESTING. While there is no clear understanding of when a seed becomes ripe enough to responsibly harvest, the seed coat is still apparently unhardened in September. October and November harvests have yielded viable seeds. If seeds are borne on branches high enough above the ground (and especially if the branches are drooping from a seed-grown mature tree), squirrels are unable to access them prior to natural seedfall (which may not happen until November). 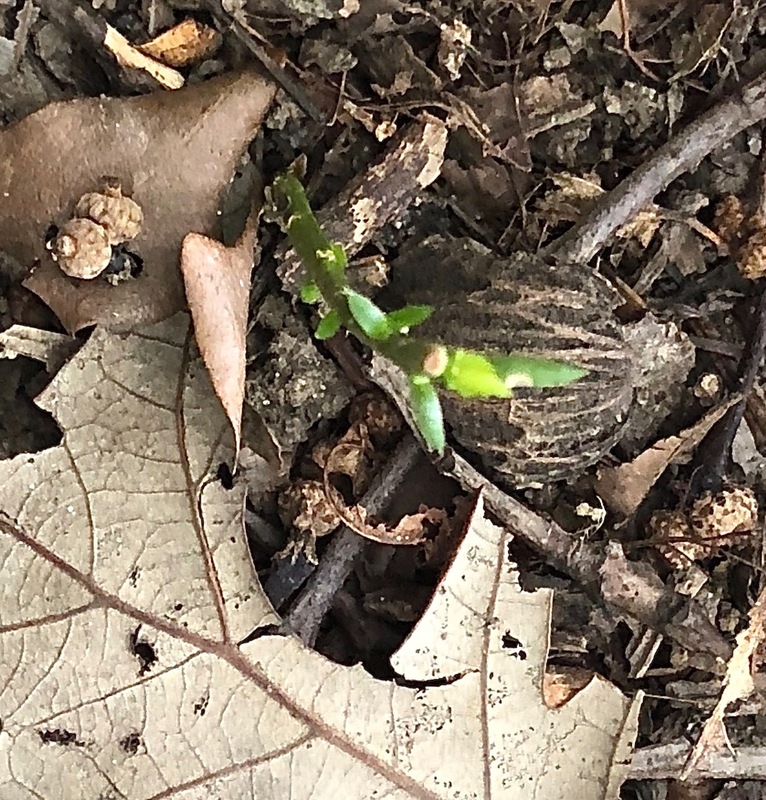 An interesting question is whether squirrels are less eager to gather and bury torreya seeds during a mast year of neighboring seed-bearing trees (especially low-tannin White Oaks). 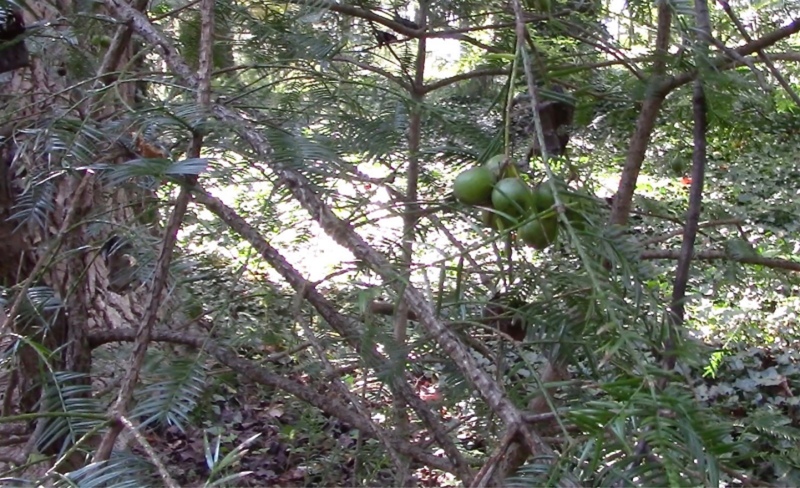 ABOVE LEFT: Ripe seeds hanging from a 20-year-old short, mature Torreya nurtured in full sun on a lawn in Mt. Olive, NC. (Home of A.J. Bullard, October 31, 2013). Temporary storage in moist peat, moss, or soil is standard practice. Care must be taken to ensure that moisture is not excessive, as over-moist seeds readily rot. PHOTO LEFT: Connie retained a small number of seeds from the 2014 autumn harvest with the idea of testing southern Michigan's climate for free-planting. But storing them through the winter and preparing for planting in April made about a dozen of them rot (in a plastic bag in the fridge). Connie must have over-moistened the sphagnum moss. A gentle squeeze pushed the white ooze visible here from the rotten seeds. 3. POST-HARVEST EMBRYO DEVELOPMENT. 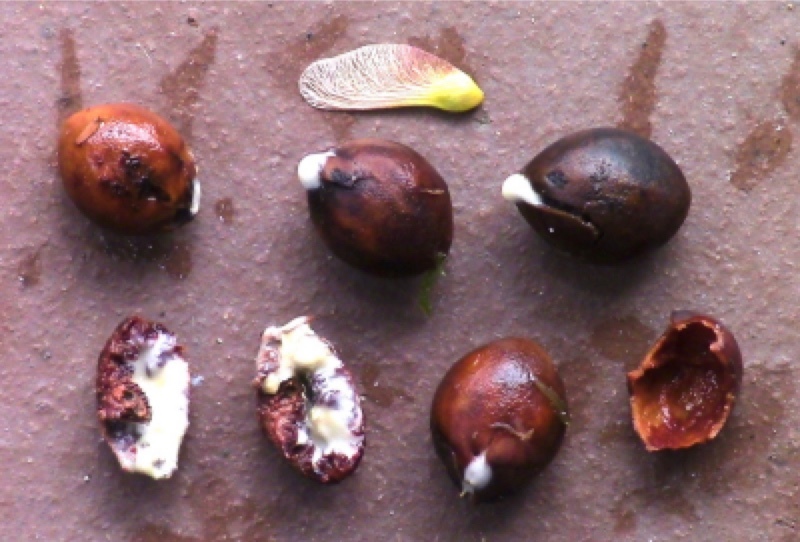 Torreya's large seed contains an embryo that continues to develop for many months post-harvesting. It is unknown whether temporary placement in a refrigerator prematurely signals to the embryo to halt development and enter an extended resting state. Indications are that it is a bad idea to place seeds in a kitchen refrigerator such that strange sequences of light/dark are experienced by the seed. Overall it is highly recommended to simply get the seed to its ultimate destination and into the soil there as quickly as possible. As of 2018, the best example of this planting technique is our volunteer planters on the Cumberland Plateau of Tennessee. Chris and Christina Anderson planted 400 seeds directly into their 232 acres (mostly on ravine slopes and mostly under rocks) in just two days in the autumn of 2015. They even flagged all locations. 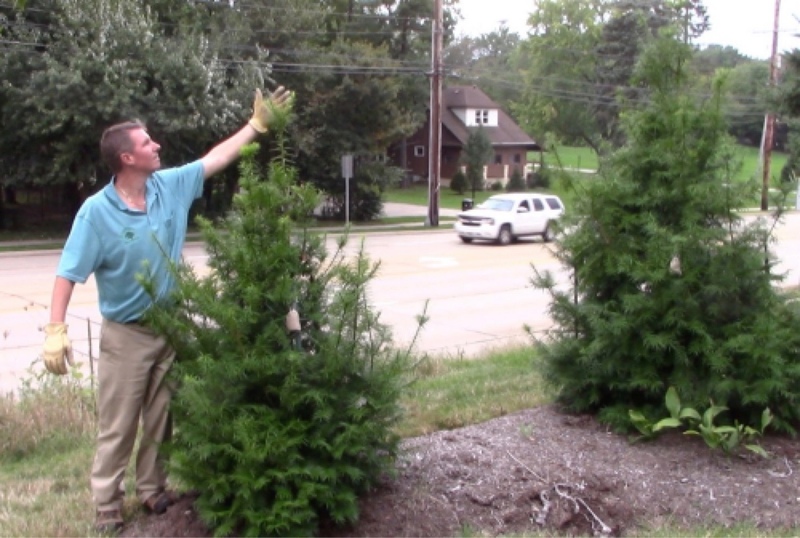 PHOTO: Chris Anderson with a new free-planted Torreya seedling, October 2017. Video 24 (a and b), posted on youtube, records the site visit. "... Ovulate (female trees, when producing, bear very small ovules on shoots of the current year's growth. The ovule is fertilized 4-5 months after pollination. The ovule develops into a single seed covered by a fleshy aril (Coulter and Land 1905, Buchholz 1940, Willson and Burley 1983). In September or October of the second year, the fleshy aril surrounding the seed matures, turning from light green to purplish-brown, and often splitting horizontally (Barnes 1985). At Maclay State Gardens, gray squirrels gather the seeds as soon as the arils turn purplish: September 20 in 1984, September 29 in 1985 (Weidner 1986). Mature, ripened torreya seeds harbor immature embryos that require substantial development before germinating (Roy 1974). Alternating periods of stratification under warm (ca. 50-70F) followed by cool/cold (ca. 40F) and a second warm period appear essential for proper embryo development, although the duration and degree of cold stratification needed is still unclear (Barnes 1983b, Roy 1974) Germination is slow, ensuing in one to three years but most frequently in two years (Meyer 1981). The long seed dormancy period, combined with the long seed development period, means that roughly four to five years elapse between pollination and seedling emergence...."
5. TIMING OF GERMINATION AND ABOVE-GROUND GROWTH. While a small portion of harvested seeds that are free-planted may send growth above ground late in their first summmer, seedlings usually begin to appear late in their second summer. Prior to that time, the embryo is developing and establishing roots underground. The greatest number of free-planted seeds will offer up seedlings during their second summer and even into the fourth year's opportunities for growth. 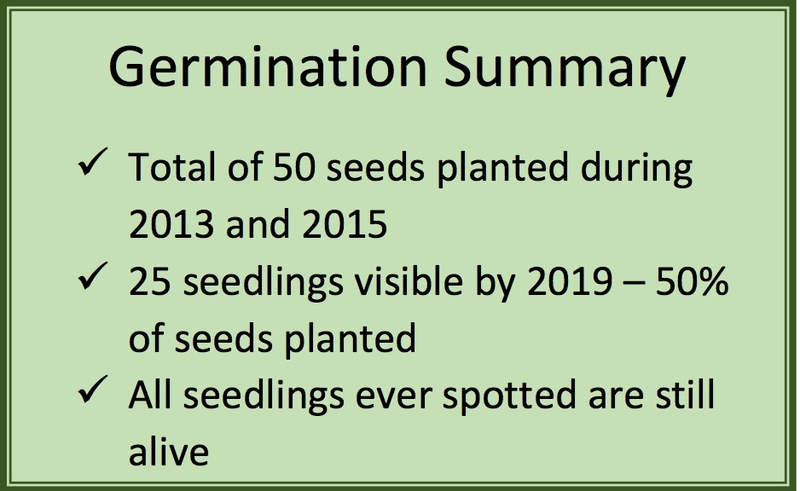 In 2019, seed free-planters in Greensboro NC confirmed that while 4 of 30 seeds planted Fall 2013 delayed above-ground growth until late summer of 2017, no new emergences happened during the following (5th) summer growing season. Herbivores may nip off the initial stem before planters notice anything. But as shown directly below, Torreya's large seed has demonstrated tremendous capability to put forth a second attempt before finally succeeding in setting leaves into the light. Therefore, it is a good idea to not give up on a seed until after its fifth or even sixth summer. Consider the pair of PHOTOS BELOW. 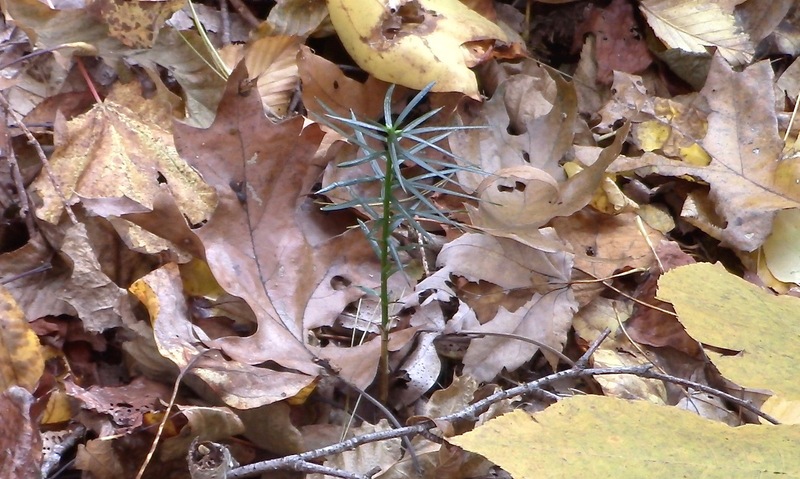 At first glance, this seedling reveals just one growth episode by the end of the fourth summer after its seed had been planted directly into forest habitat. However, close examination of its base shows a cropped original stem still green 1/2 inch to its right. The first growth episode thus would actually have been a prior vertical stem, with leaves radiating around it. Then it was cropped off almost to the ground by an herbivore. The seed next put forth a replacement stem during its fourth growing season. 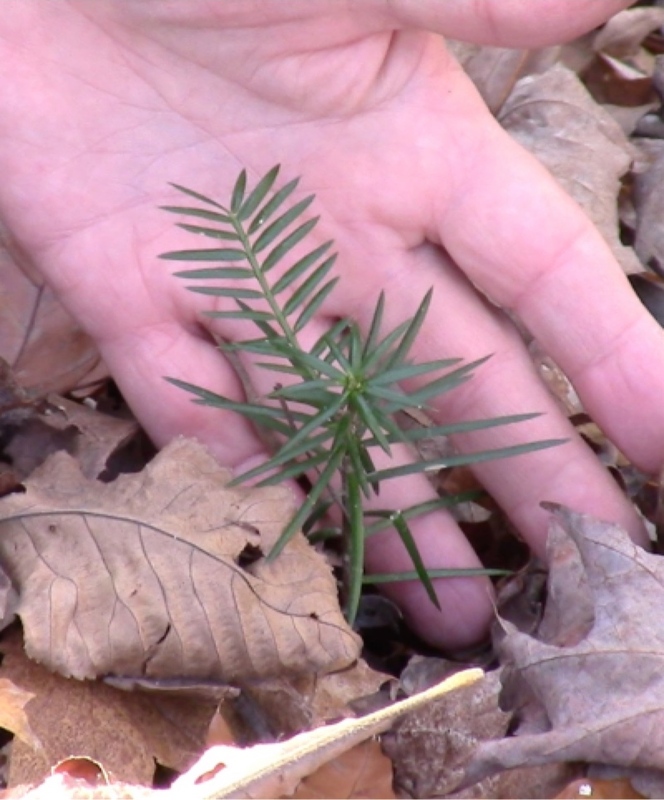 ABOVE: North Carolina forest free-planting by Russ Regnery, April 2015; photos by Connie Barlow during site visit November 2018 (following fourth summer post-planting). In the early years of free-planting trials, Connie began testing whether rocks could prevent seed-predation. Mistakes she made early on included choosing rocks far bigger than necessary, whose size begat new risks to the seed. 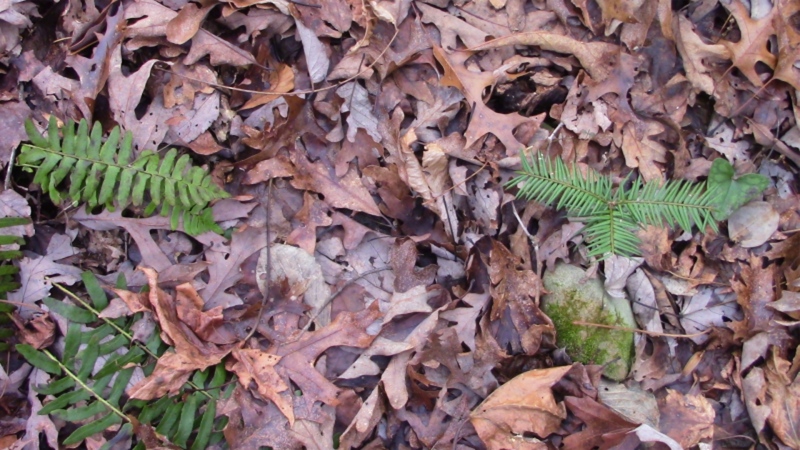 PHOTO LEFT: Connie Barlow planted several seeds under rocks in northeast Alabama in 2013. In November 2017 she looked beneath the rocks that had not yet produced seedlings. 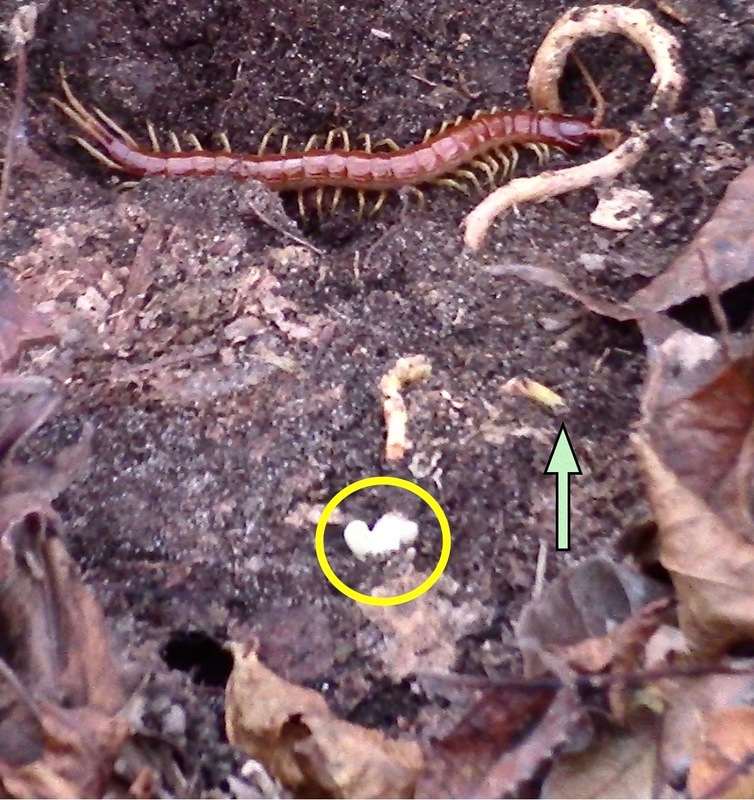 Rocks that had been placed on flat ground were attractive to insects  such as this centipede. 2. 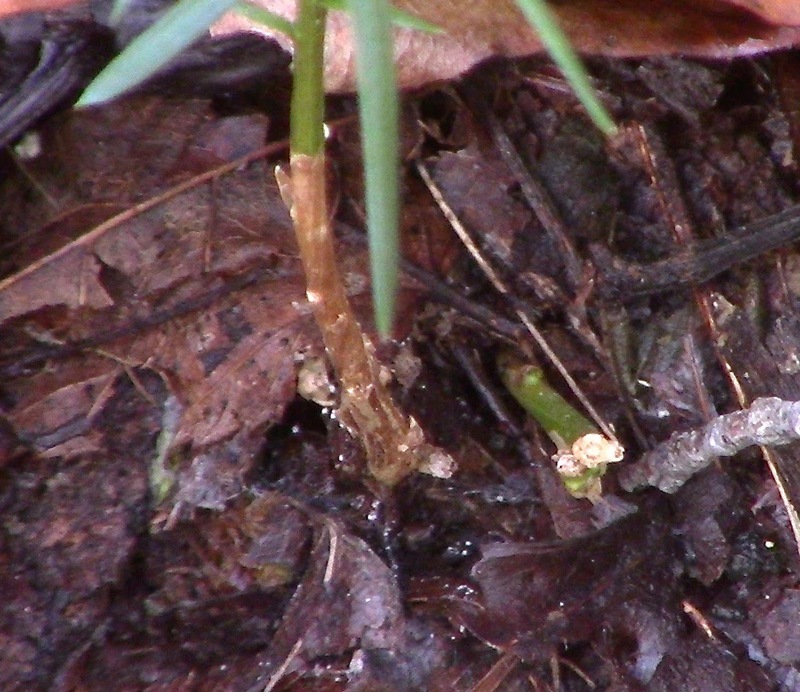 The yellow circle encloses what may be fungal growth, in line with where another exploratory leader segment seems to have re-entered the ground. ONE YEAR LATER, November 2018, there was little left of the now-dead leader growth, and ants had taken over. INTERPRETATION: The seed may have made two attempts at finding a way out from the rock. The seed did not contain sufficient stored energy to survive the ordeal. 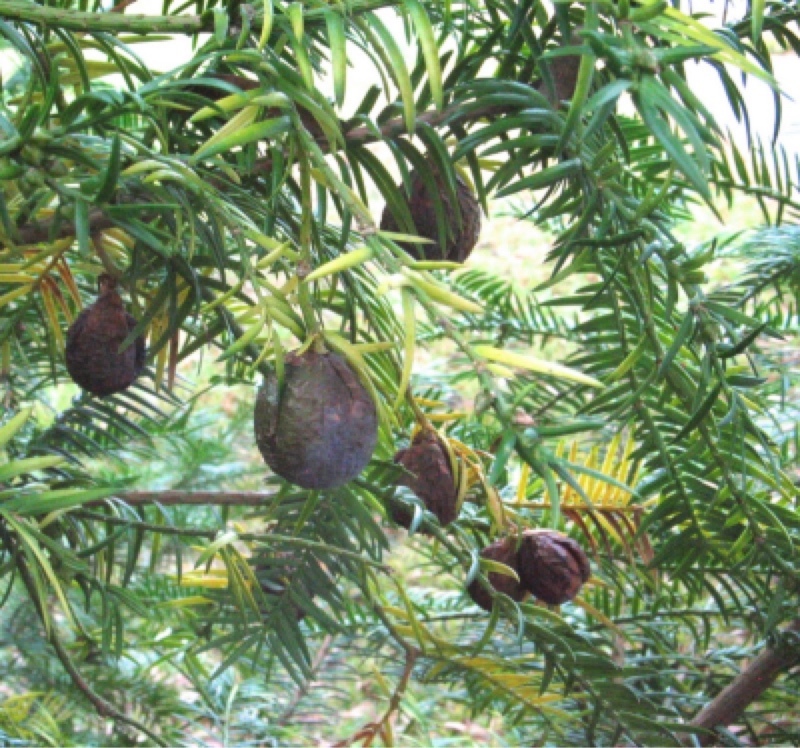 LEARNING: While Torreya's large seed gives it opportunities to recover from multiple above-ground injuries, herbivory can be lethal if it has already used up a lot of stored energy in trying to grow its way out from under a rock. RECOMMENDAATION: Use rocks just big enough to prevent squirrel predation  or plant at depth instead (3 to 6 inches deep). PHOTOS ABOVE: Connie placed a very large rock on a gentle slope (thus, moisture seepage from upslope likely prevented insect or vole occupation). Nonetheless, the seed itself had been placed near the lower end of the rock  before Connie learned the hard way that an exploratory leader almost always trends upslope. These 3 photos document the consequences of (a) faulty seed placement and (b) torreya's remarkable capacity to grow for long periods before sunlight is accessed. 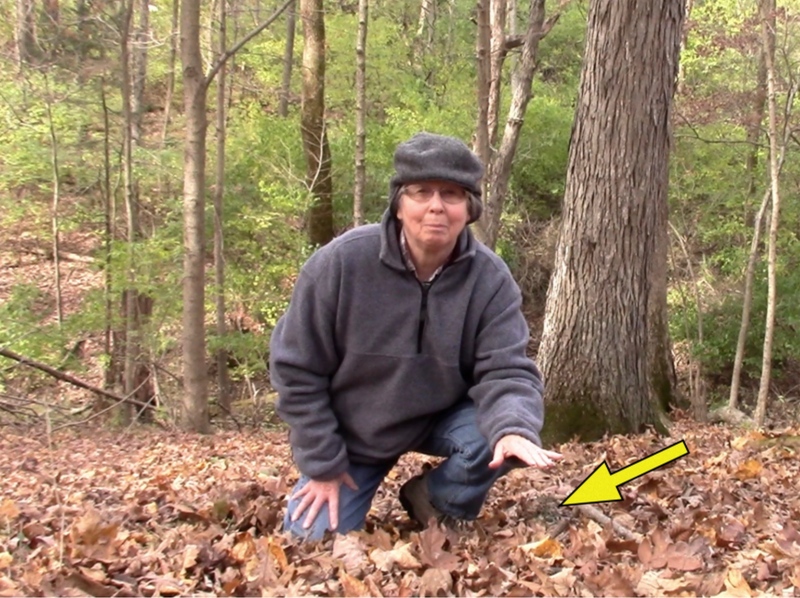 PHOTO ABOVE LEFT: November 2017: Connie visited this northeast Alabama site and looked under the rock. What an amazing effort this seed had made! The yellow arrow points to where the initial leader (still green where it had emerged from the rock) had been cropped off by an herbivore. The green arrow points to the tip of a second leader attempt underway. See that this second exploration seems to have "learned" to aim directly upslope from the seed, rather than looping the seed (as the first had done) before "deciding" on a direction. Connie replaced the rock several inches further downslope  such that the leader tip just barely emerged beyond the rock. ABOVE CENTER AND RIGHT: November 2018: One year later, Connie checks again and is thrilled to see that the seed had enough stored energy to grow this second attempt to completion. But see how this new growth is much shorter than usual. 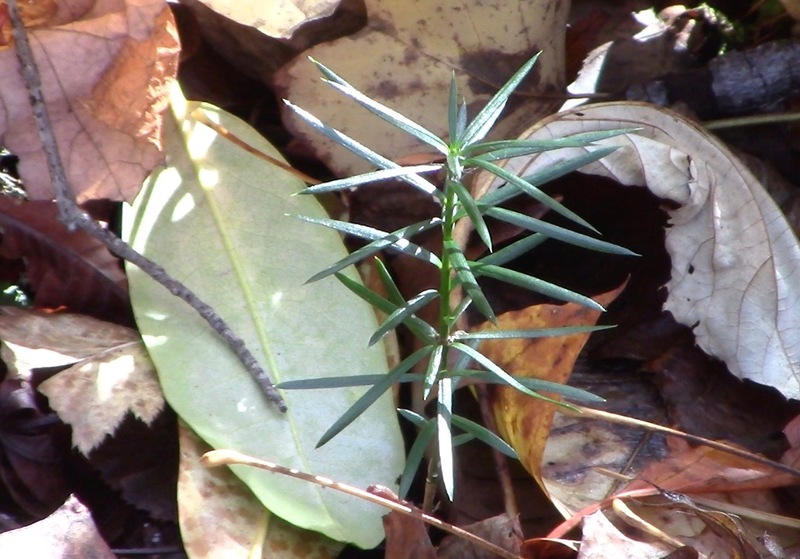 As soon as emerging from under the rock, this individual grew just tall enough to spread its leaves to the sun. LEARNING: Because Torreya's seed is huge, indicative of subcanopy adaptation, it is demonstrably capable of growing (and regrowing) a great deal (below and above ground) before needing to access energy from sunlight. Seed predators include squirrels digging from the surface and smaller rodents who establish tunnels underground. Prior to beginning the free-planting experiments, seeds were protected from predators via placement in protected pots or outdoor soil beds protected above and below by close-weave wire. (1) Planters don't need to find and carry rocks of suitable size and proportions. (2) Overly large rocks can attract rather than deter burrowing rodents and/or ants, especially if they shield the ground from rainfall seepage. Large rocks, especially if placed on flat ground where there is no downslope seepage, are especially vulnerable to the risk of animal habitation. They also, of course, likely deprive the seed itself from at least some rainfall moisture. 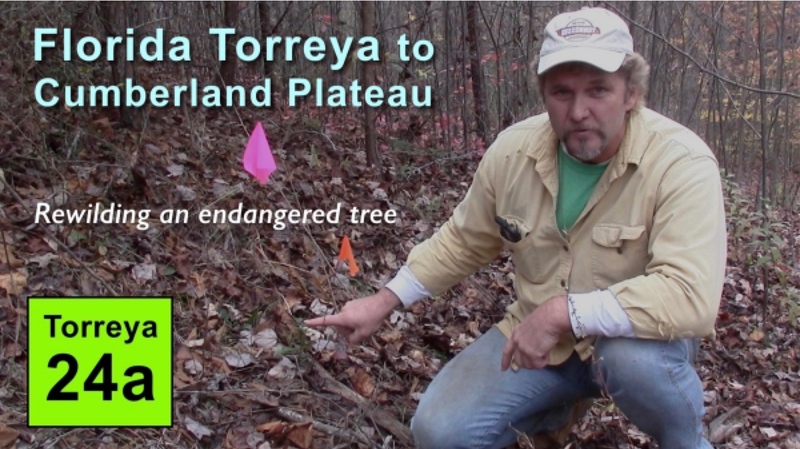 March 18, 2019 Connie Barlow visited 2 sites of Torreya Guardian plantings, just 20 miles apart in the Ocoee River watershed and 500 foot elevational difference. At the Greasy Creek TN site (1,100 foot elevation), a total of 50 seeds had been given to Clint Bancroft 4 years earlier (March 29, 2015). Clint reports that about 40 seeds germinated  80% germination rate, in which all seeds were fully protected: "The seeds were grown in a large pot with wire grating over the top. When they were about a year old I moved them into individual pots and none showed any transplant stress." 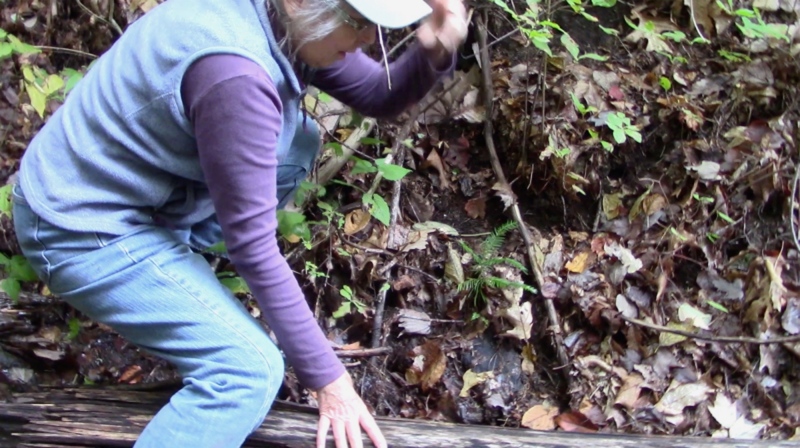 In contrast, when Connie visited the Murphy NC site nearby (1,600 foot elevation), thorough exploration of the free-planted forest sites (no protection, shallow planting) by three individuals walking and observing as a group found no seedlings. 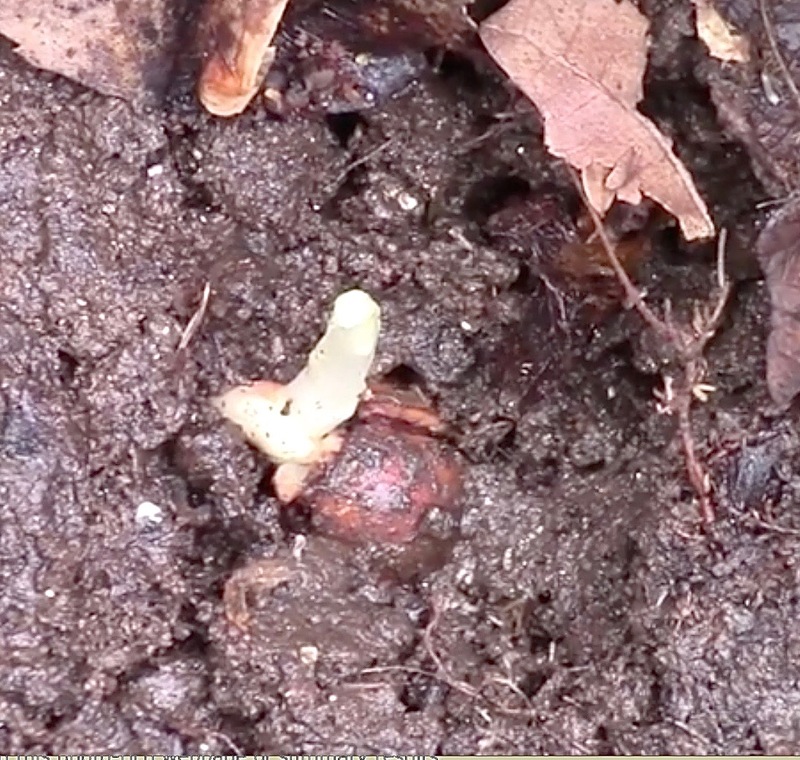 A total of 41 seeds had been planted (video-documented) on March 29, 2015. Given that both sets of seeds were delivered on the same day (by Connie Barlow) in 2015 and came from the same stock, overwintered in the same outdoor bucket, it is reasonable to assume that perhaps 30 would have germinated at the Murphy NC site had rodents not predated them. Rodent predation was thus total for a set of 30 viable shallow-planted seeds. This is strong evidence that seeds should never be planted at a shallow depth unprotected. October 2013 Connie Barlow had access to enough seeds to justify initiating free-planting seed experiments (which would obviously result in significant failures compared to the success rate of wire-protected pots and planting beds). 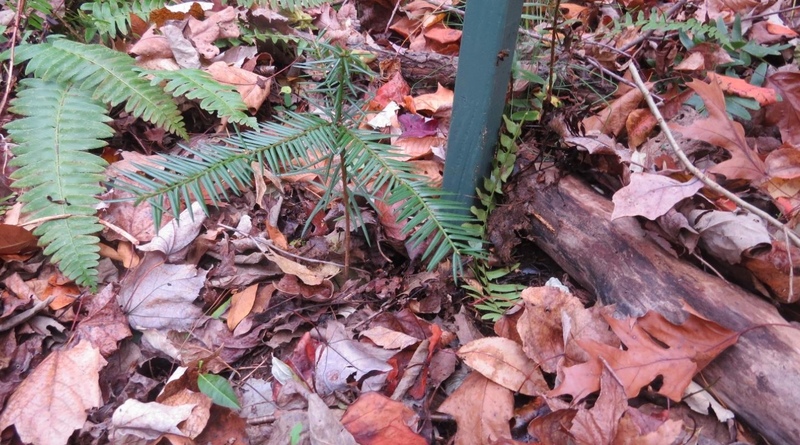 This early free-planting experiment was carried out within the regrowth forest of Sara Evans in Waynesville, NC (where 21 potted seedlings of Torreya had been planted in July 2008). 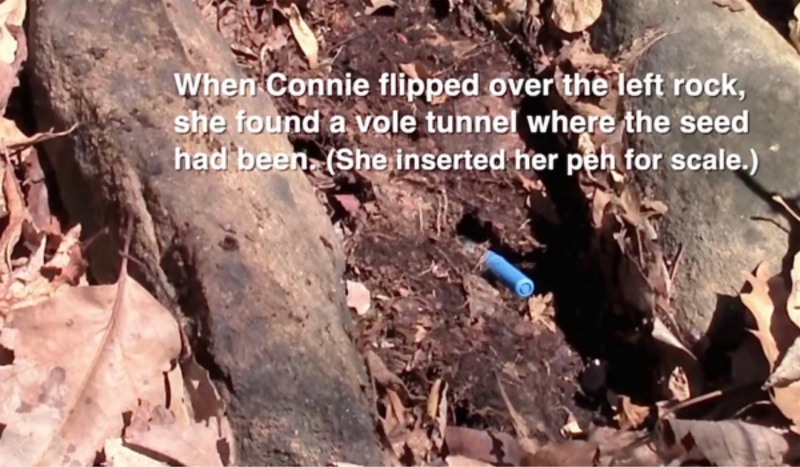 Eighteen months later, Connie returned to the site. April 2015, first results of free-planting experiments in Waynesville, NC. For the seeds that had been placed under rocks, she looked beneath (as none had produced visible seedlings yet). She was delighted to discover that 4 or 5 seeds had germinated (example PHOTO LEFT ABOVE) and that other rock-covered seeds were still intact but not yet germinated. 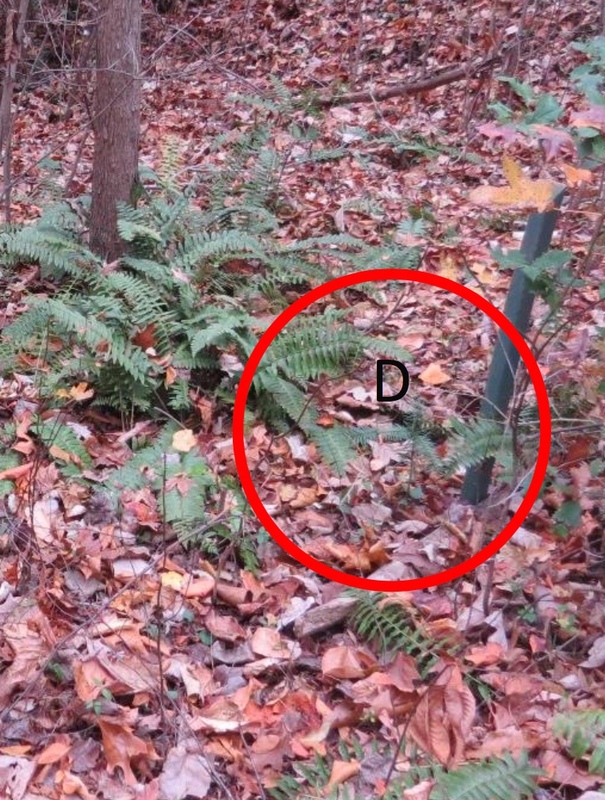 Many of the experimental seeds, however, were absent  and vole tunnels, (example PHOTO RIGHT ABOVE), provided solid evidence of the cause. 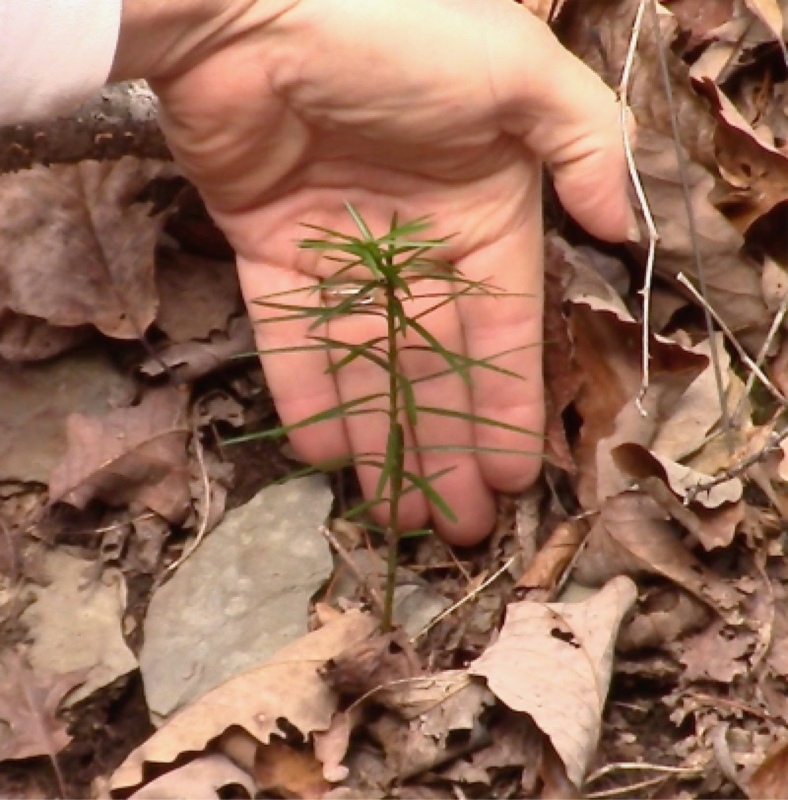 A 47-minute video shows the highlights of Connie's April 2015 site visit in Waynesville NC to check up on the October 2013 free-planted seeds. Put a seed 2 or 3 inches deep under a rock just large enough that a squirrel can't push it aside. Do this on a slope, and place the seed under the upslope end of the rock. ABOVE: Torreya Guardians in Greensboro, NC became the first successful free-planters of seeds when they documented first above-ground growth in November 2015 (of seeds planted November 2013). Nelson and Elaine Stover contributed the photo above left (notice the deciduous canopy context) and the numerical tally in January 2019. Fortunately, on their own they decided to plant seeds 3 inches deep  and with no rock protection above. Their success with 3-inch depth planting is confirmed by later planters, as reported below. The Stover's 50% emergence rate is likely far more attributable to standard germination failure than to underground seed predation. One established depth planter is Diana Spiegel of Dayton, Ohio (photo left). She free-planted 12 seeds 6-inches-deep into her regrowth forest. The planting was in April 2016, using seeds harvested fall 2014 (thus she successfully stored seeds through two winters while recovering from an injury). 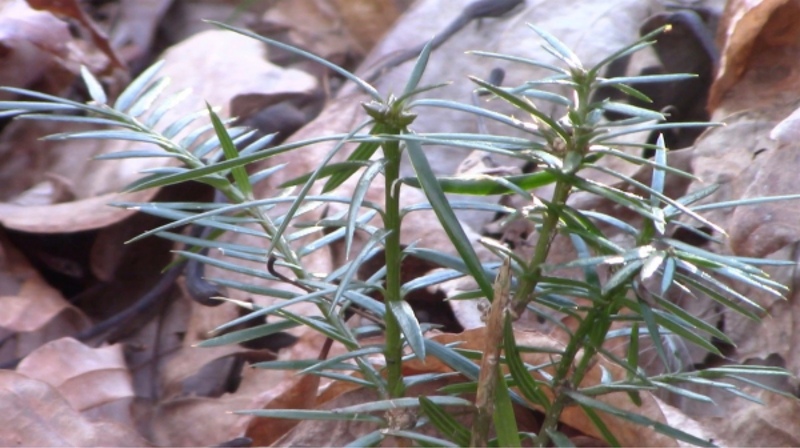 Connie Barlow filmed progress onsite November 2017, recording 5 of the 12 seeds showing above-ground growth. Click the photo to access the 15-minute video. Two Spring 2017 free-plantings in Michigan (using 2016 harvested seeds) began to produce results in 2018. Both planters put seeds at least 4 inches deep. • Liana May in Leelanau, MI (photos below). RECOMMENDATIONS TO DETER SEED PREDATORS: If rocks are plentiful, it is useful to experiment with both rock protection and depth protection on the same site. Then contribute your findings to be added to this page. The photos below show more results. ABOVE 4 PHOTOS: Only two of the 56 seeds (2014 harvest) free-planted in May 2015 by Bob Miller and Connie Barlow in Bob's hardwood forest near Cincinnati, Ohio appeared above ground by November 2017 (when all 4 photos above were taken). Planting was shallow and there was no placement under rocks because it was not until December 2015 that Connie revisited initial experiments and began interpreting for best practice recommendations. Even so, more seeds may have emerged in this forest site later; and because we did not flag each planting site, several hours of intense scouting may still not have revealed all seedlings. ABOVE 4 PHOTOS: In April 2015 Connie Barlow made a site visit to the 2008 torreya plantings at the forested home of Russell Regnery. 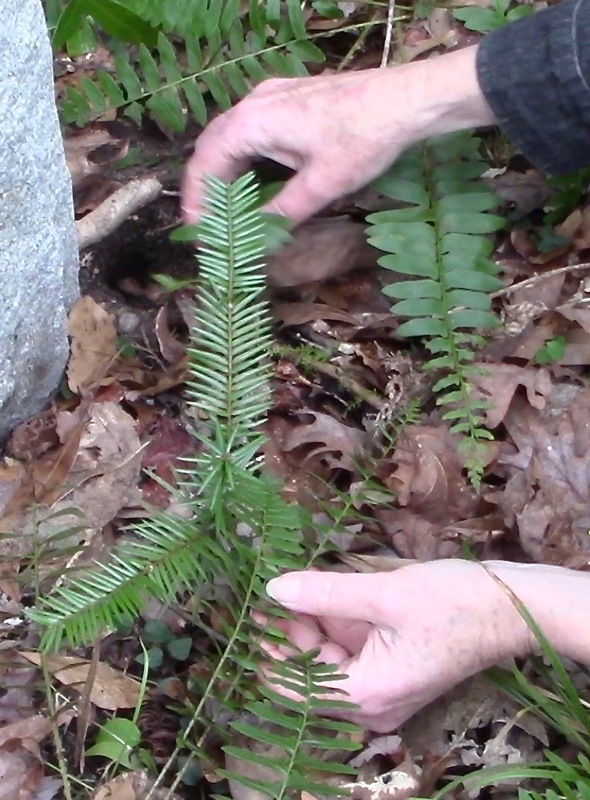 She brought with her 50 seeds from the 2014 fall harvest for free-planting directly into the forest. Connie videoed Russ free-planting 15 of the seeds that day. No rock protection was used and Connie did not know at the time that depth planting was important. A return visit November 2018 brought a surprise: 6 of the 15 seeds had produced seedlings  with no human assistance. This is an extraordinary rate of success. 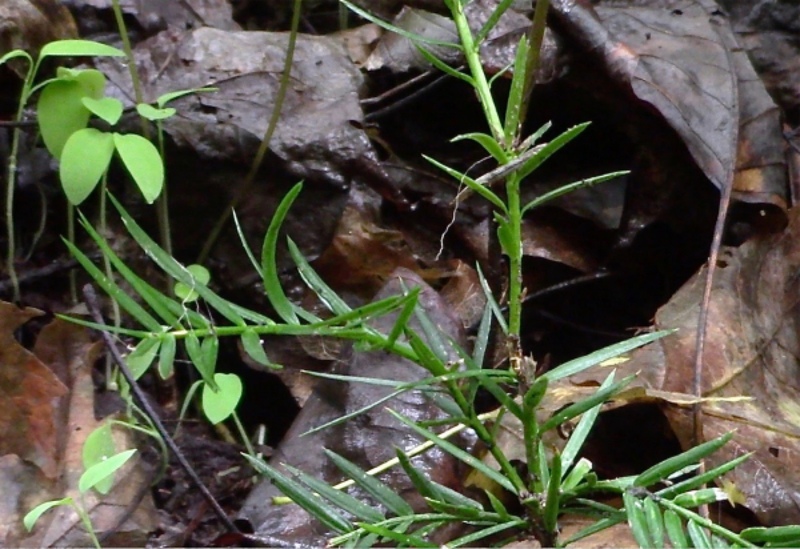 Several of the seedlings are shown in the four photos above. Two of the six displayed great ability to recover from herbivory of the main stems and apical shoots. One such survivor was shown earlier on this webpage and the other is the third example in the next section on above-ground herbivory. 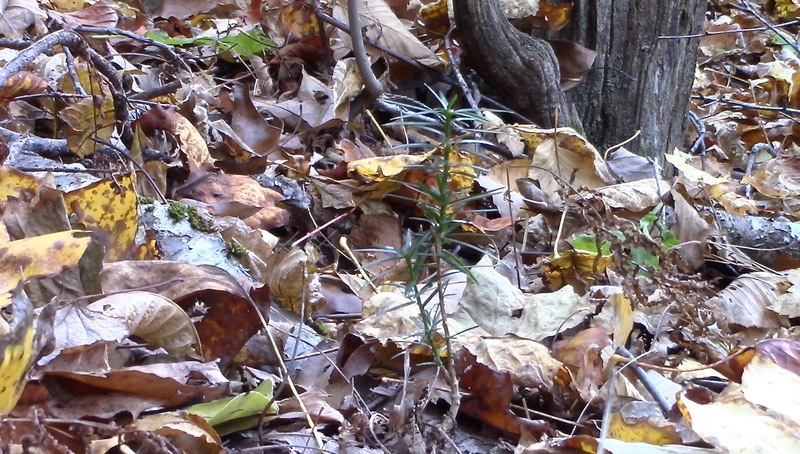 Field documentation of the 6 seedlings that grew and survived with zero human help, following "free-planting" of 15 seeds directly into forest soil in April 2015. Russ Regnery was the planter, within his forest at 3,800 feet elevation on the slope of Black Rock Mountain, near Franklin NC. Video clips of the 2015 planting (Episode 12) are matched with the actual seedlings closely photographed and analyzed Nov 2018. A Photo-essay of this site visit is also online. 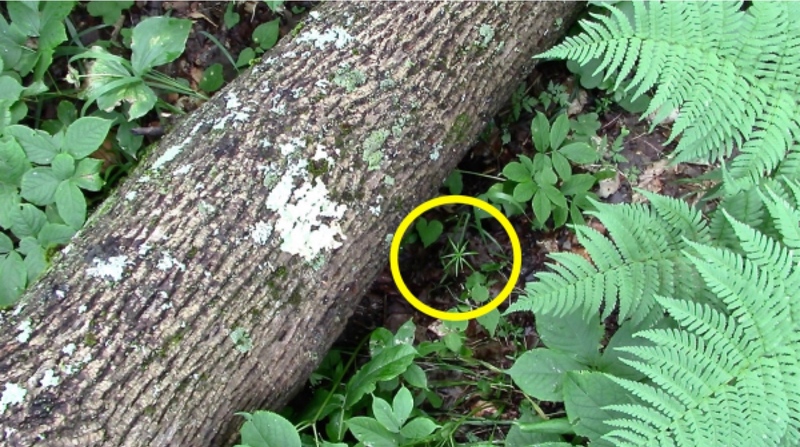 Herbivory of apical growth is generally the most damaging for a young tree. 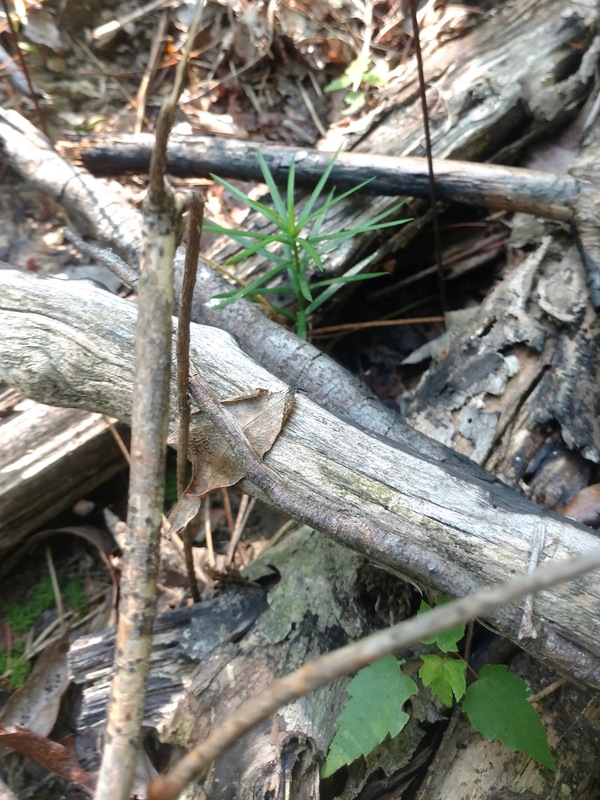 Yet, with rare exception, Connie Barlow reports that newly emerged and young seedlings easily survive such injuries and grow replacement main stems either from the surviving stem section or as a basal. A series of photos will show examples. Photos below by Nelson Stover in sequence Nov 2016, May 2017, and Nov 2017 show herbivore devastation followed by recovery. Notice that the response was three-fold: a new apical budded from a low section of stem, along with a basal stem emergence. During the end-summer flush, another vertically trending growth filled out at a high position on the injured stem. Notice in the middle photo that its tiny green start was actually visible in May. 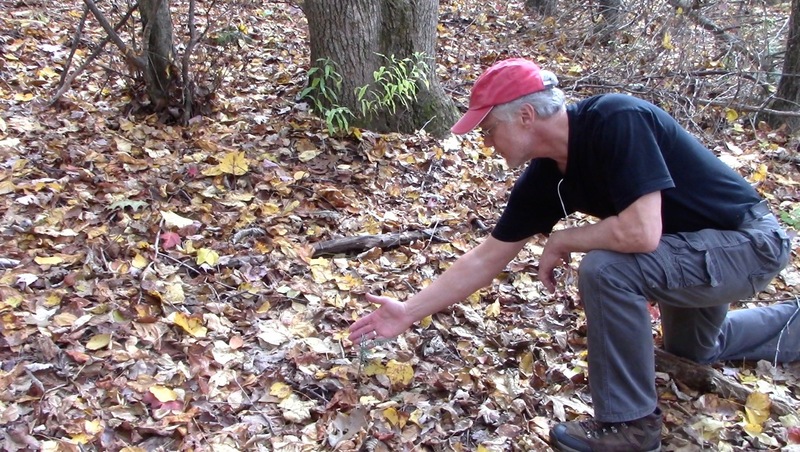 Background: All seeds were "free-planted" directly into the soil of the Stover's regrowth hardwood forest, with no overlying rock or wire protection. 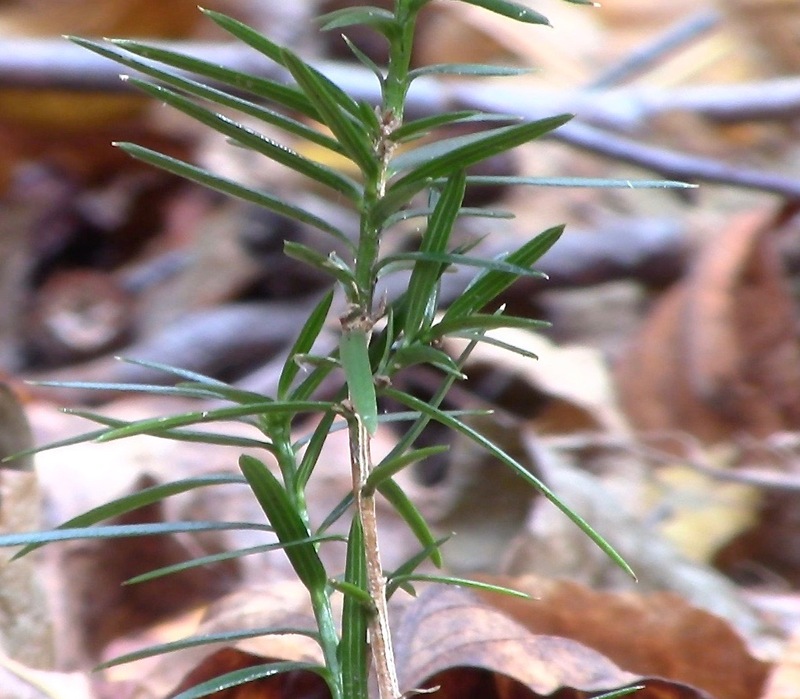 Of the 30 seeds introduced into the forest November 2013, 15 became seedlings within the first four years. This is a good success rate, likely attributable to seed-planting 3 inches deep. 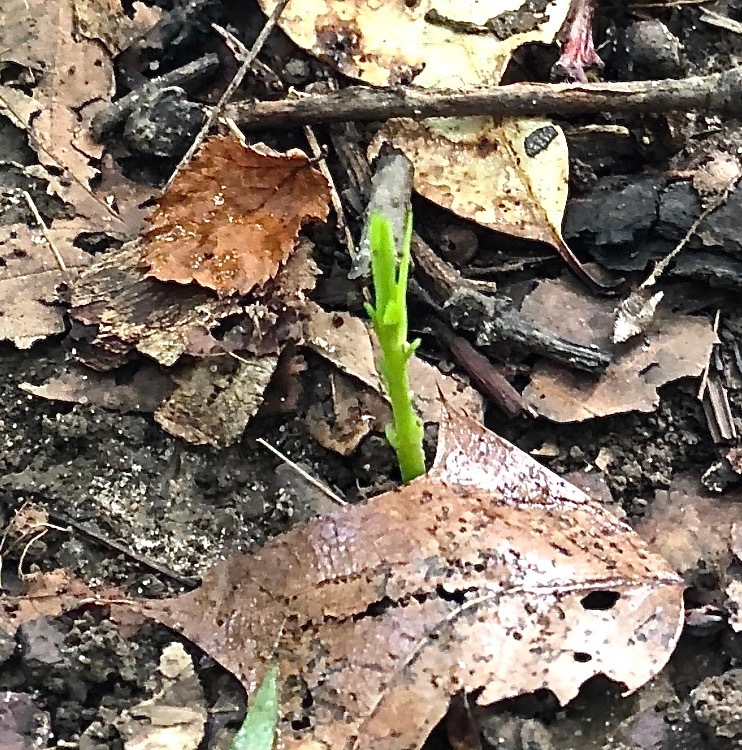 Photos below by Paul Camire show: LEFT: 19 July 2018 first sighting of a newly emerged free-planted seed (seeds were planted 4-6 inches deep April 2016). The apex had already been nipped off by an herbivore. RIGHT: Seven weeks later, the seedling had fully recovered its apical growth  and had added some height. Because the seed is so large, this prompt growth spurt is likely derived entirely from the stored energy underground, rather than current photosynthesis. PHOTO SEQUENCE OF NIPPED SEEDLING RECOVERING, left to right: July 19, August 23, September 6. 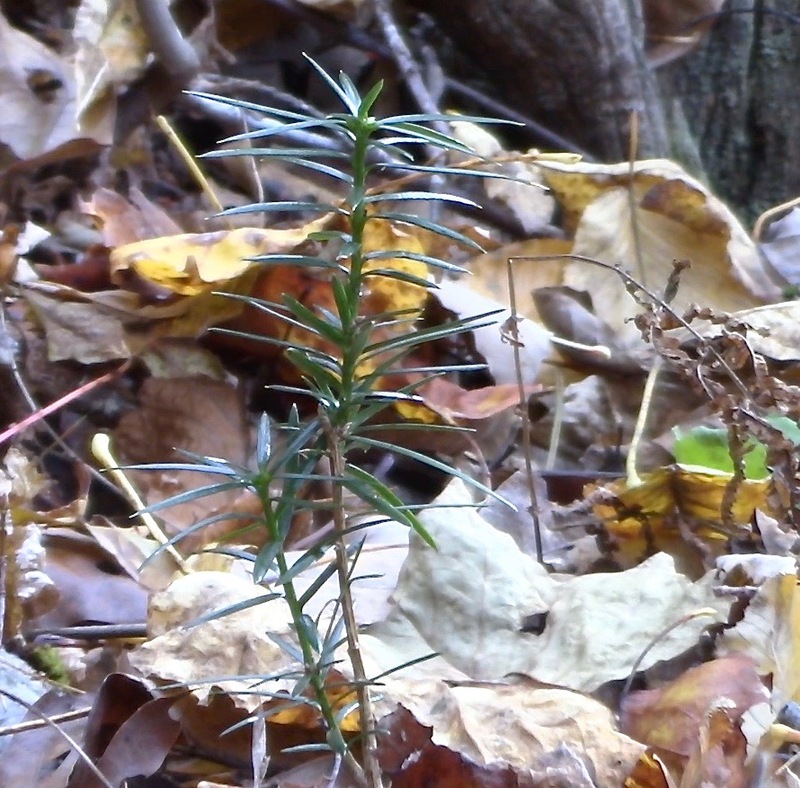 ABOVE: The side view of this seedling (photographed Nov 2018; it was free-planted with no rock or depth protection April 2015) shows four instances of vertical growth: three on the main stem and one on the basal. This is unusual because, while the seedling always emerges as one vertical stem bearing radial-patterned needle-tipped leaves, the next growth spurt normally is one or two lateral (horizontal) branches. A closer look (below) indicates that one, two, or possibly even three episodes of apical herbivory prompted the unusual growth pattern. Experience indicates that apical integrity will always be ensured or recovered before growth is directed laterally into branches. 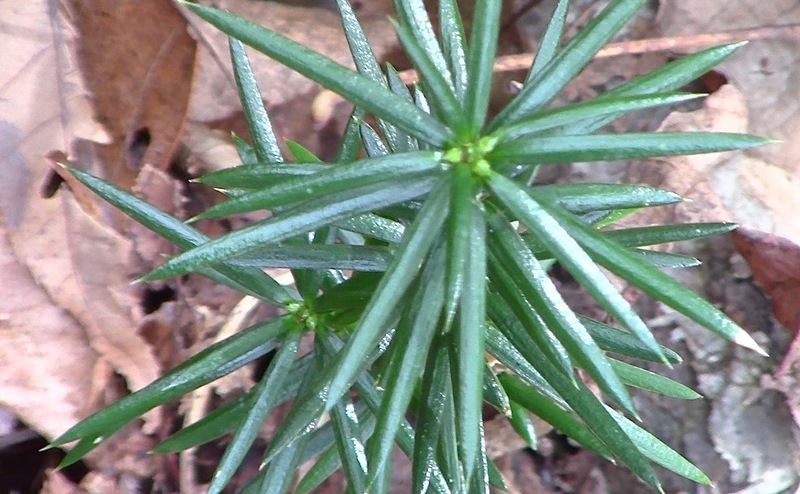 ABOVE: Notice that the main stem shows three growth spurts vertically. Also, notice the color differences in the older v. the younger stem sections. New stem growth begins green, but by late the next summer it browns. 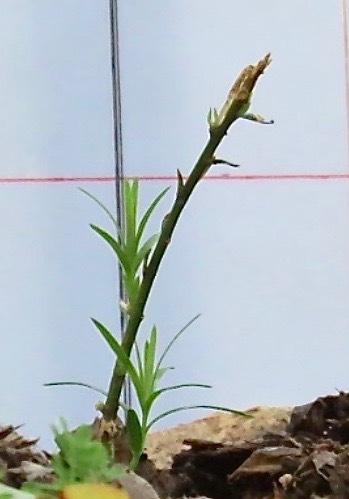 The close-up photo of the seedling's midsection reveals another (but very short) supplementary growth just below the main stem injury, but this one angles more (toward the right) and is very short. It seems midway between the form of a vertical leader and a lateral branch. Look carefully at the top of the closeup photo: Did that post-injury new stem get cropped again, just an inch or so above where it started? (Notice the brown at that spot.) If so, the green above that spot would signify yet a third leader attempt (a better camera angle would answer that). Might the second injury have prompted the strange tuft of short angled growth on the right? And was it the first or the second herbivore nibbling that prompted the basal to sprout?. See the basal photos below. ABOVE: Closeup views of the new basal stem. 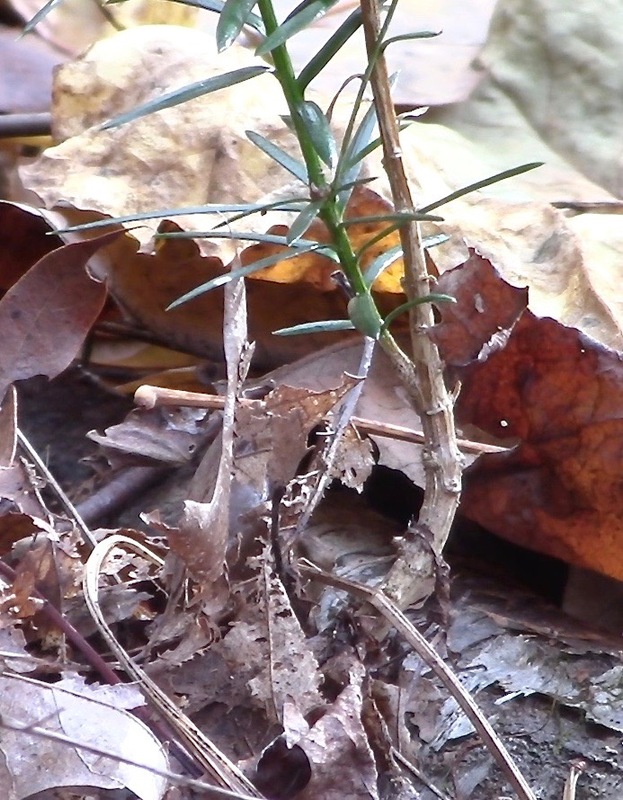 The basal stem is still green, so it probably emerged either late summer 2017 or spring of 2018; all these photos were taken November 2018. Basal growth is an important survivor feature of genus Torreya. Basal growth can quickly supplement photosynthesis. A basal stem can also entirely replace the older main stem if the latter is injured. ABOVE: Despite the lack of lateral branching (owing to emergency vertical growth replacements following repeated instances of apical herbivory) a top-down view shows a great deal of photosynthetic capacity on this seedling. One would conclude it is quite healthy. 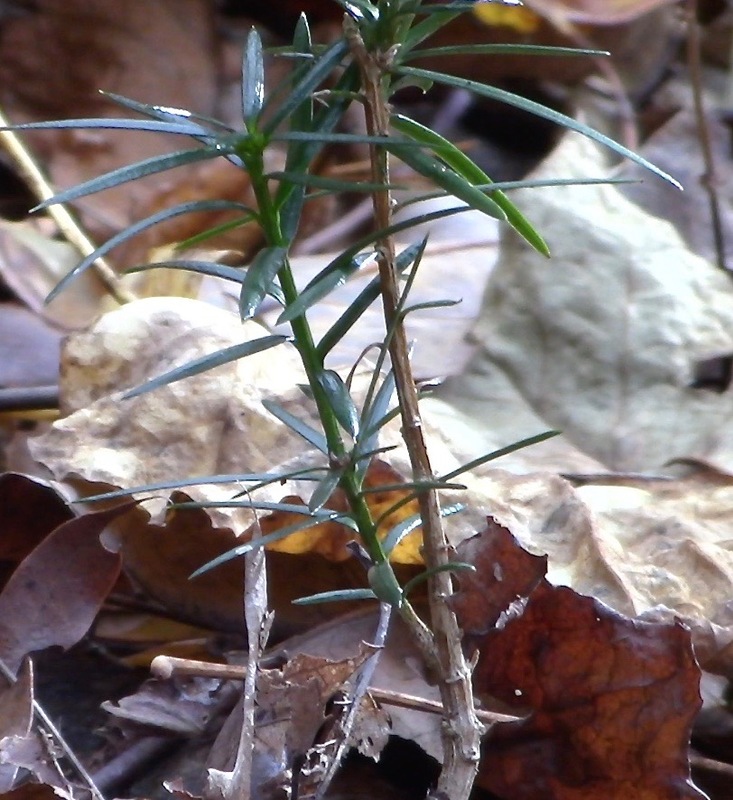 Notice in the close-up photo that (unless the apex is eaten off again in the coming winter) that this seedling has prepared vegetative buds at the top that will produce 3 lateral branches in the spring of 2019. 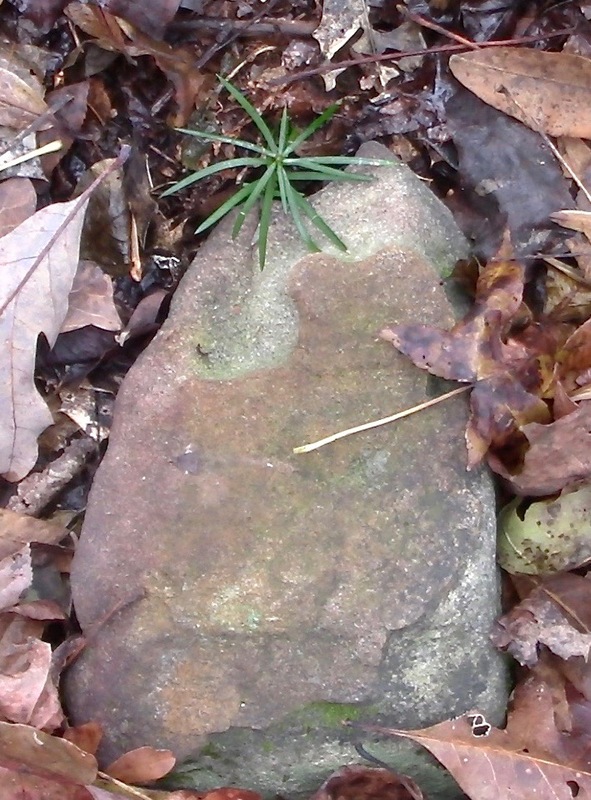 ABOVE: A seed was planted beneath this rock October 2013. It emerged from the upslope side sometime before December 2015. 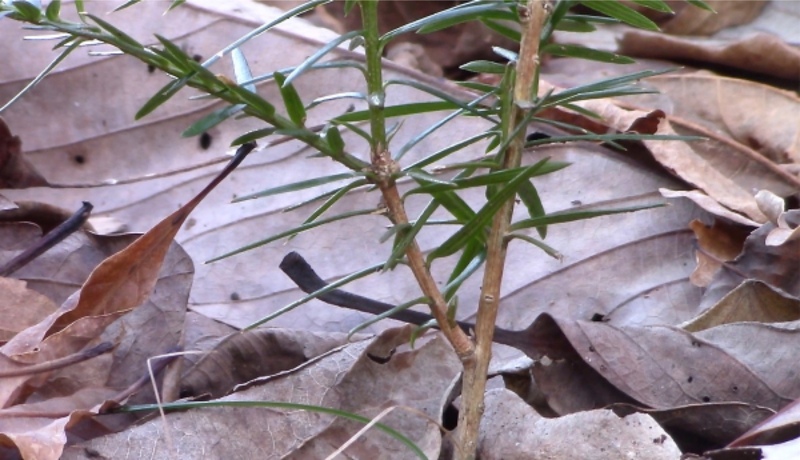 ABOVE LEFT: By November 2018 it evidenced an original removal of its original apical stem tip (right-most stem, long brown stub). A new apical emerged below the injury and is now the tallest of the three vertically growing stems. Close examination of the tall one suggests a brown stub to the left of its topmost tuft; this might have been a beginning lateral that was nipped. ABOVE RIGHT: Meanwhile, a lowest stem (or basal) had emerged near ground level. The brown section would have been the first growth burst. The green lateral and the green vertical stems emerged in a later year. ABOVE LEFT: The cluster of topmost growth suggests excellent health, despite the previous herbivory. 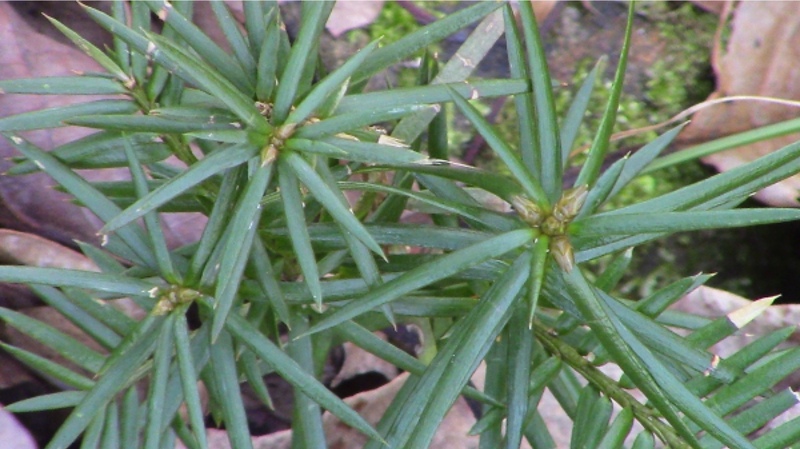 ABOVE RIGHT: A top-down view of the 3 stems with radial leaf patterning indicates that the tallest will produce 3 lateral branches the very next spring. ABOVE LEFT: 17 June 2018 photo of Torreya resprout after February 2018 managed burn of uplands. Chris Anderson reports, "This particular seedling is on the fringe of routine burning. 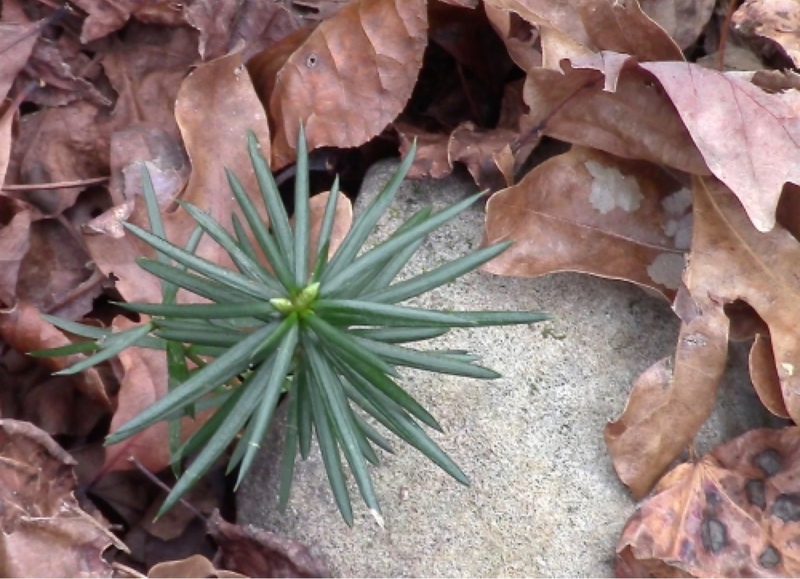 I can protect it in the future from fire, but this one was overlooked  but did respond to resprout on its own." 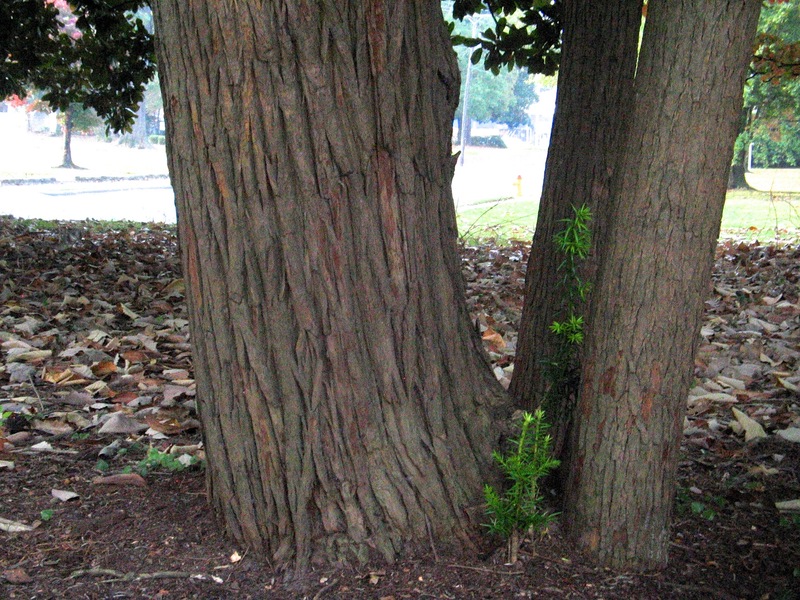 LEFT is a close-up of the Torreya that is pictured ABOVE (same camera angle). Look for it directly "below" the tree trunk. Deer can distinguish not only shapes but also the green color of living leaves from the dun colors of fallen leaves. The Torreya LEFT has the same camera angle as the photo ABOVE, so you can definitely find it on your own. This perfect little seedling showed no sign of herbivory. 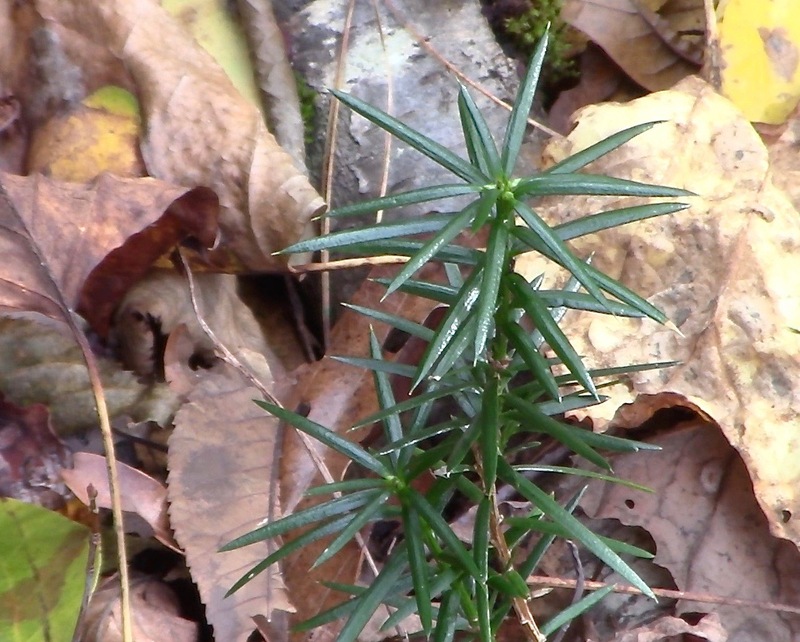 Fifty feet downslope of the above seedling in Alabama is the one pictured LEFT. Its seed escaped rodent predation, thanks to the small rock. 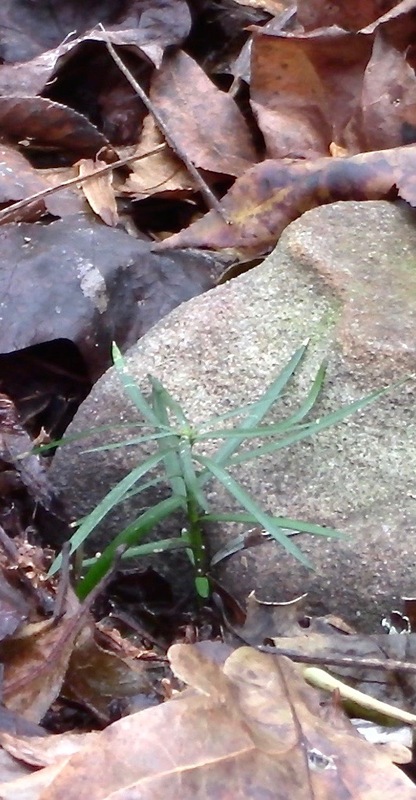 Even so, the seedling pictured above sprouted safely with no rock protection  but its seed was buried 3 inches deep. 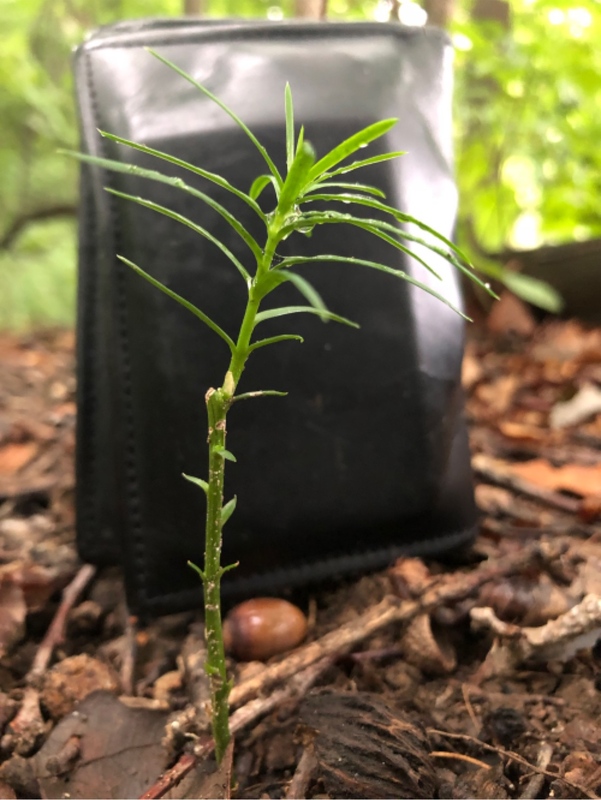 Torreya free-planters in Greensboro NC first spotted this seedling in Summer 2017, when it looked like this. Obviously, it had already emerged above ground in a prior year. 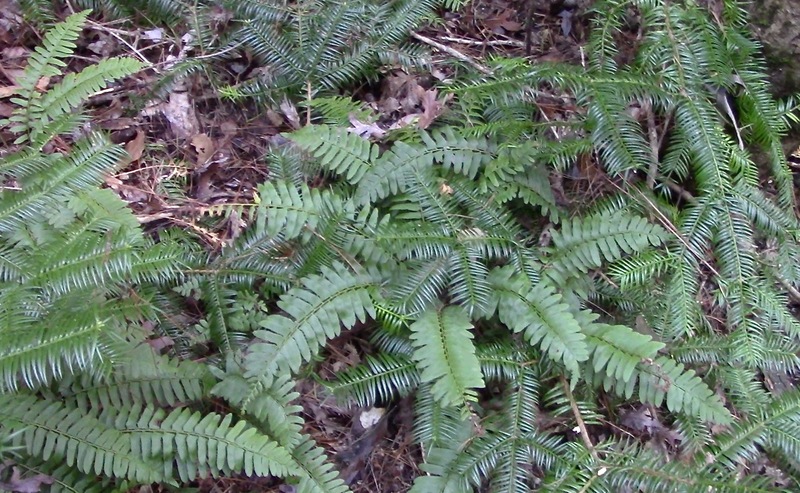 The Stovers speculated that they had overlooked it because it was camouflaged by the neighboring evergreen ferns. 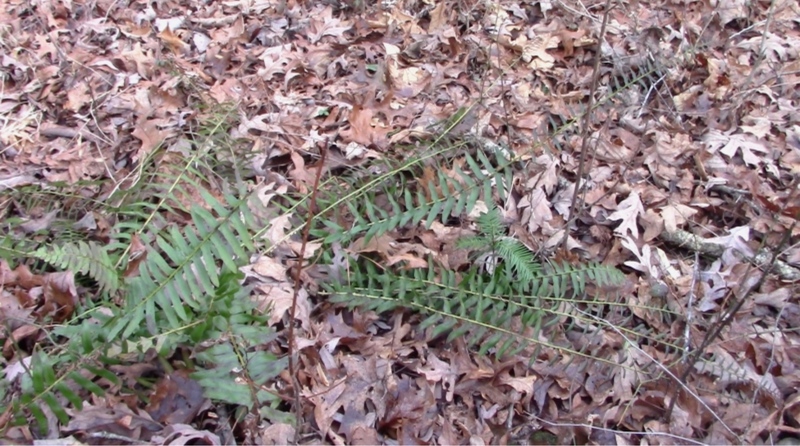 Because their January 2019 photo later suggested it had still escaped herbivory, this third example of evergreen ferns as camouflage presents a powerful case. 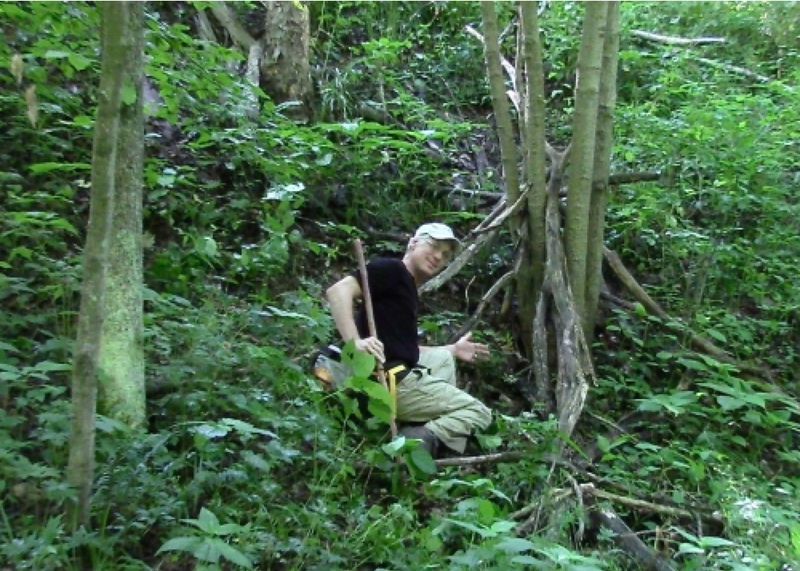 ♦ PLANTING IN DEEP RAVINES and VERY STEEP SLOPES. 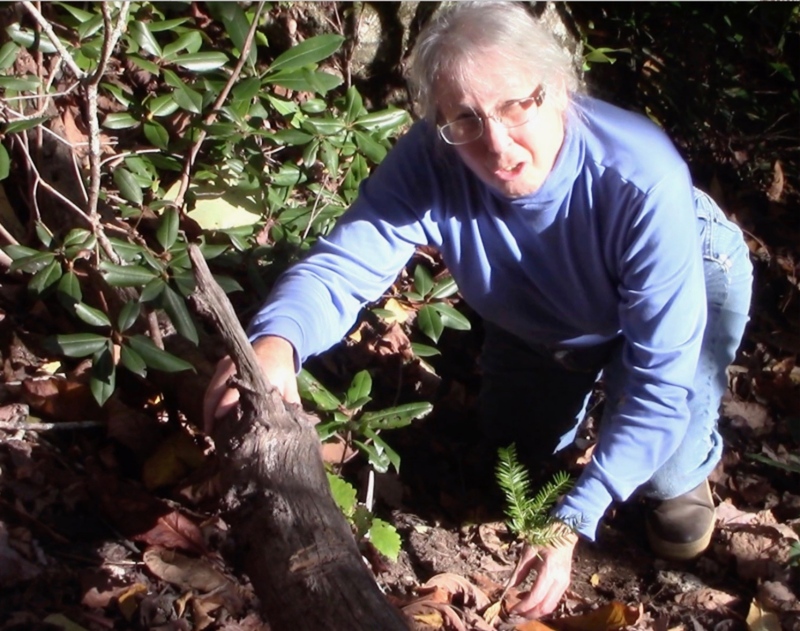 LEFT and BELOW: Connie Barlow, October 2018, with free-planted seedlings on very steep slopes of ravines in the mountains of western North Carolina. Both seedlings show no sign of herbivory. Might steep, deep ravine slopes minimize herbivory? 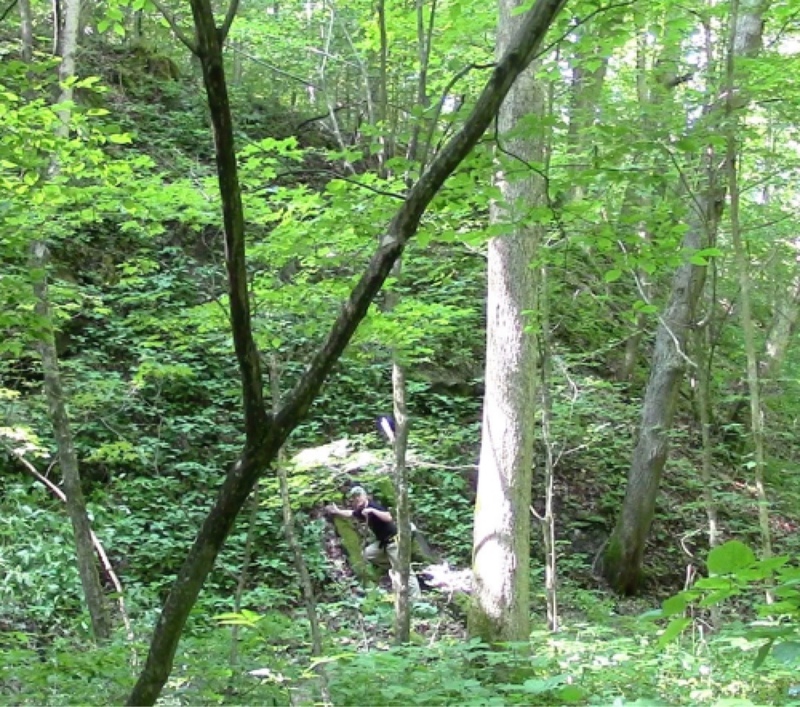 The ravine pictured LEFT is so deep, steep, and thickly forested (and the surrounds are so densely forested) that there are no deer anywhere near. Its seed had no rock protection nor depth, as Connie was unaware of the importance of depth planting October 2013. While the photos ABOVE support the steep and deep hypothesis for minimizing herbivory, the photo BELOW calls it into question. 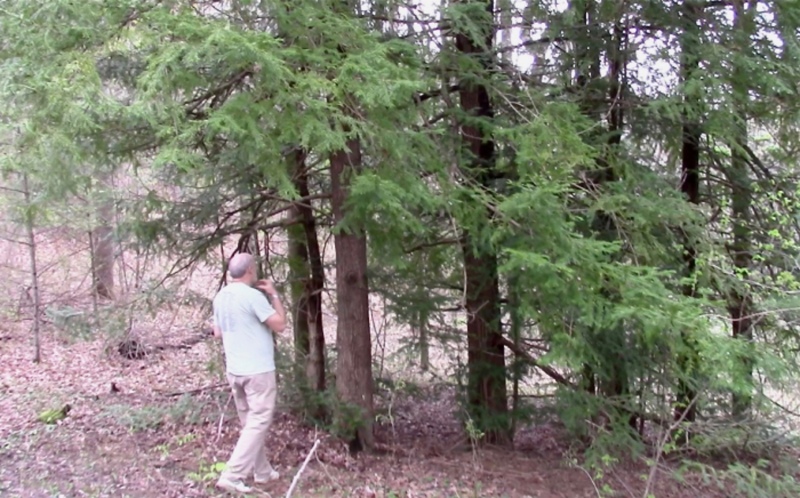 Michael Dowd, October 2018, shows an herbivory-free torreya  on an isolated patch of flat, open ground just 4 feet from a human-made trail in Waynesville, NC. 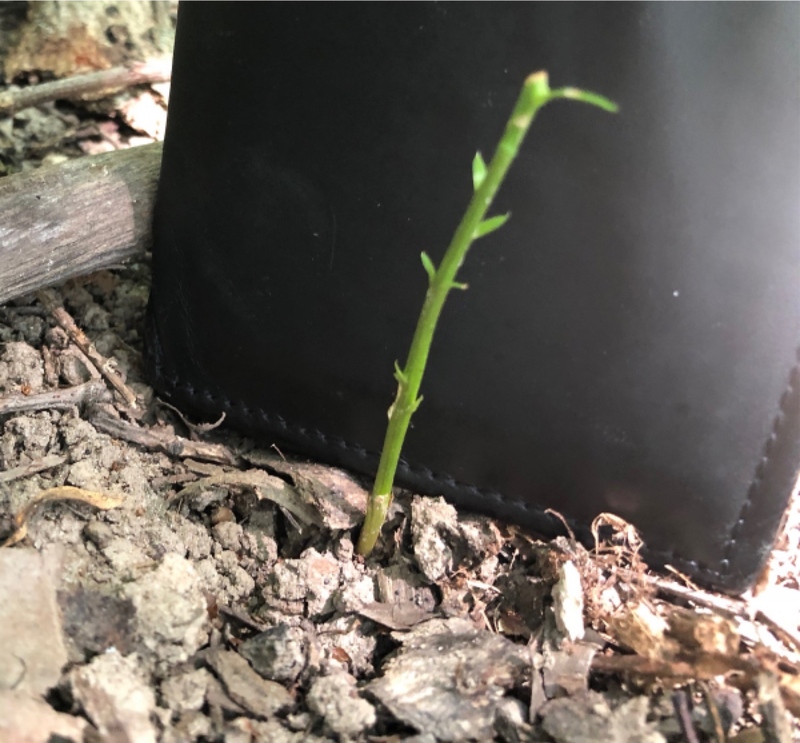 Perhaps the seedling had been protected by the branch we found upon it, laying it flat on the ground for so long that the newest growth had reoriented 90 degrees. Or, as the property owners attest, deer are virtually absent on this densely forested mountain slope. Overall, perhaps the IDEAL WAY TO PREVENT HERBIVORY OF NEWLY EMERGING SEEDLINGS is to choose sites in which deer are known to be rare. 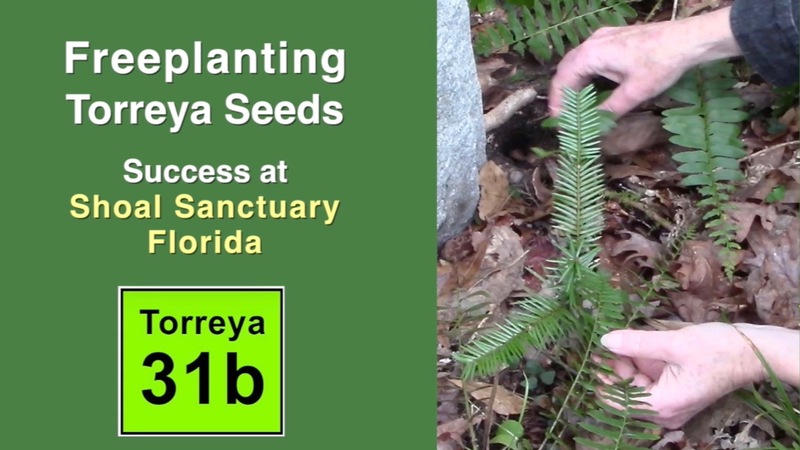 As of 2019 Shoal Sanctuary in northern Florida is in the lead for least herbivory of free-planted seeds  essentially no herbivory on all 9 seedlings generated at sites of 40 seeds planted four years earlier. Watch VIDEO 31 (in 2 parts) for detailed visuals of the intact seedlings and their surrounds. TWO SHOAL SEEDLINGS are shown below; click on the images to access both videos on youtube. 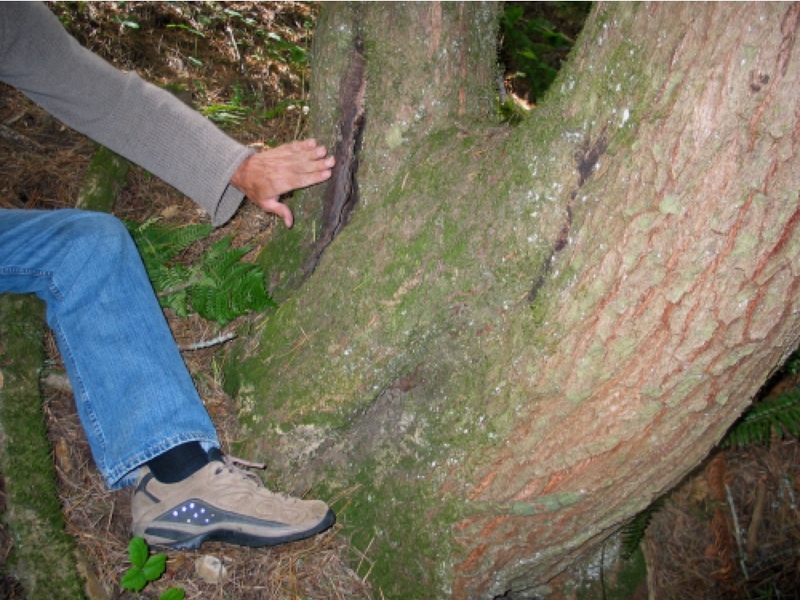 Background: The 2010 official Recovery Plan for T. taxifolia documents the extensive stem damage to the endangered wild population in Florida caused by antler rubbing of the deer population in Torreya State Park. See pp. 14 and 15 of the 2010 Recovery Plan. 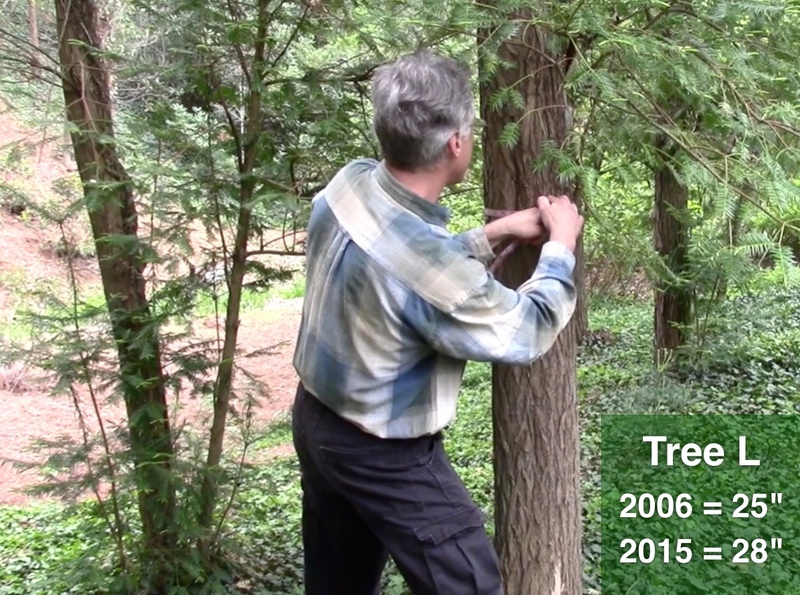 Torreya Guardian Fred Bess (photo left) installs temporary fencing each autumn to fend off deer antler rubbing. He has just 4 saplings in his yard (Cleveland, Ohio). All were carefully nurtured in pots in his greenhouse and all are just a few steps from his backdoor. So he can make those installations. But what about free-planted seeds, especially when planted in remote landscapes? None of our free-planted seedlings are even close to being tall enough (2 feet tall) to attract buck deer. But when the time comes, Torreya's flexible branches armed with needle-sharp evergreen leaves will be very enticing. Siting is about the only avenue for minimizing antler-rubbing, where fencing (or brush piles carefully placed) are not possible. Steep and forested mountain slopes of the southern Appalachians are ideal because deer are infrequent visitors in those habitats. But exurb or farming areas beyond the mountains can be crawling with deer. 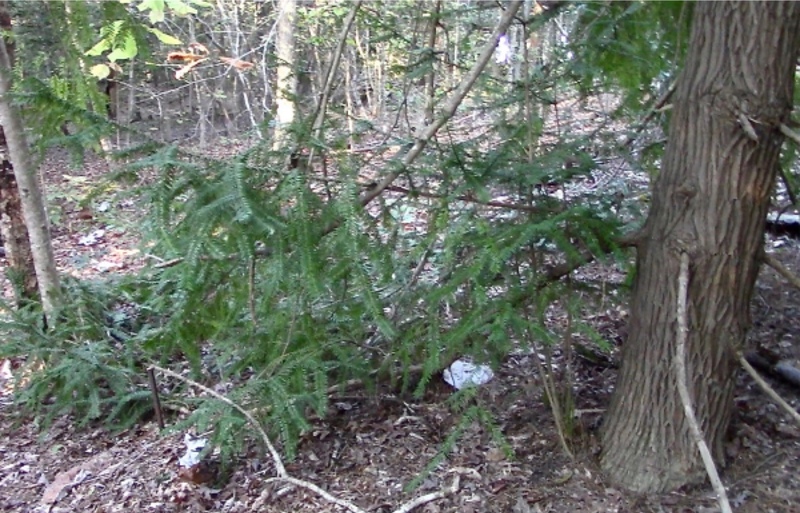 In Michigan, for example, young hemlocks 2 to 4 feet tall take a real beating in the fall. What is to be done? Look for the steepest slope you can find, even in otherwise flat areas. Deer can of course run up and down steep slopes, but they are less likely to stop mid-leap to sample an evergreen bush. Below are several examples of free-planted Torreyas intentionally sited on the steepest slopes in the region. SEEDLING A 2016: Photos above. 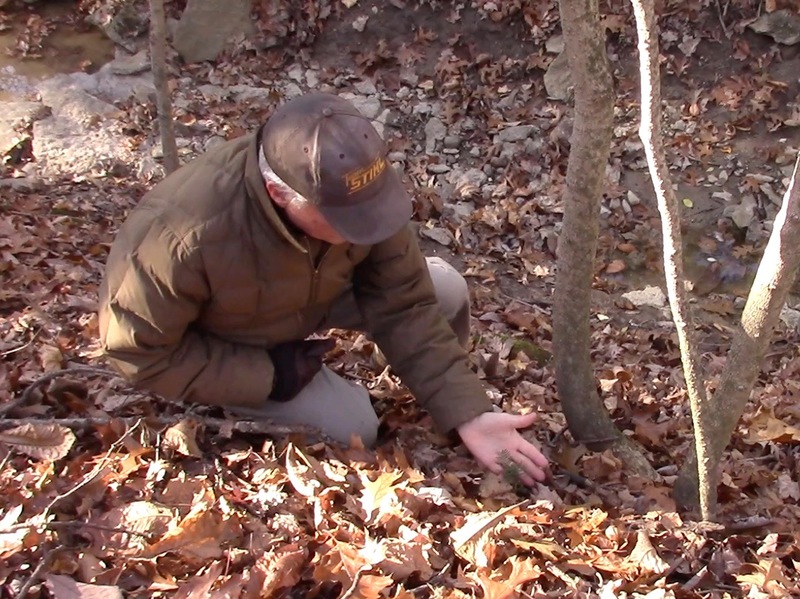 Michael Dowd points to a seedling he spotted on the steep slope right above a small creek in limestone country. 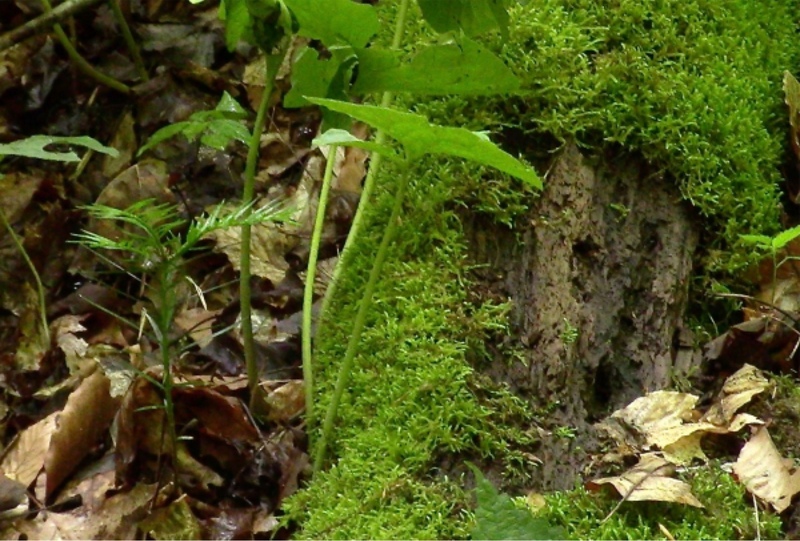 The seedling itself is just to the left of a parallel pair of old moss-covered logs. SEEDLING A 2018: Photos below. Lateral branches have extended, but a close look shows recovery from herbivory. See the tiny light-green terminal bud, ready to burst the following spring. 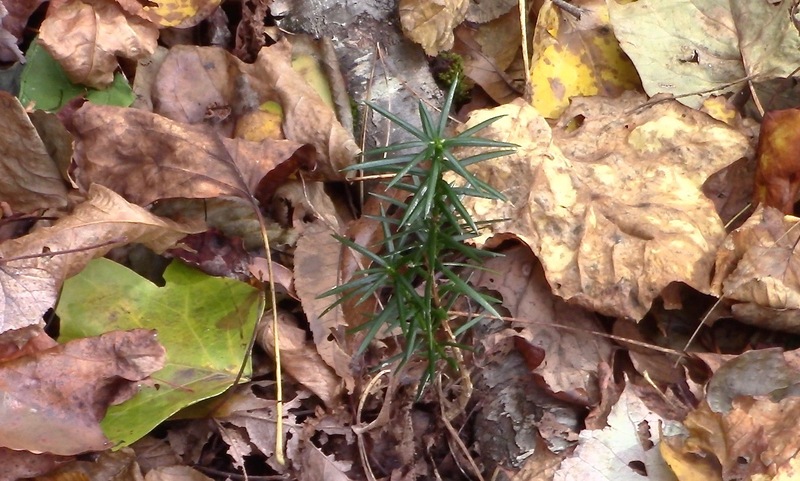 EIGHT PHOTOS BELOW are of the second seedling along the same Ohio creek. SEEDLING B 2016: Photos above show Michael Dowd perched on the slope with his hand behind the young seedling, which is shown above right. SEEDLING B 2018: The two photos below show excellent recovery from herbivory. 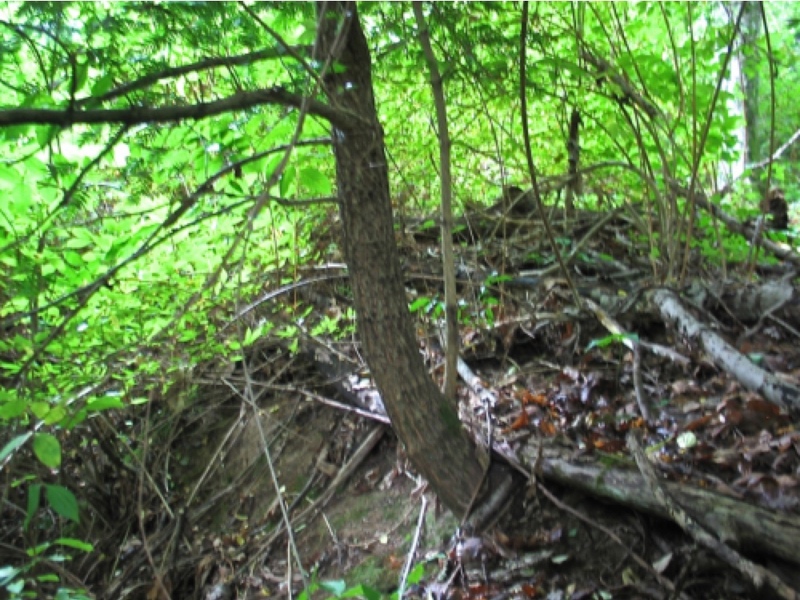 The tangle of fallen branches and multi-stem proximity, in addition to steep slope, makes it unlikely that a buck will choose this torreya in ten years for an antler rub. October 2015 Chris and Christina Anderson planted 400 seeds directly into their 232 acres (mostly on ravine slopes and mostly under rocks). The variety of habitats chosen, coupled with the sheer number of seeds planted, will produce statistically significant results re habitat preferences over the many decades of this long-term experiment. Habitats included the steepest ravine slopes on their property  both for ravine conditions that are cool and moist during even the hottest, driest summers and to minimize deer antler rubbing. PHOTO: Exactly 2 years after freeplanting seeds: Chris Anderson on left; Michael Dowd on right. 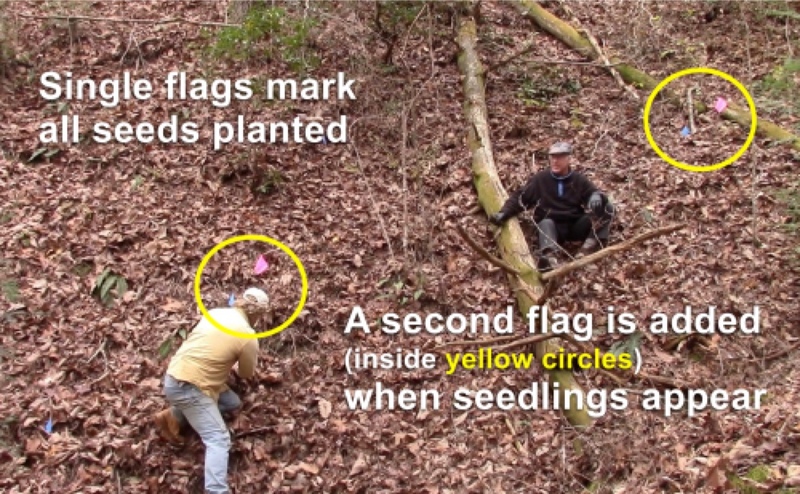 Double flags on this very steep ravine slope indicate (a) that a seed was planted in each location and (b) that a seedling is now visible. For context, view how steep the slopes can be where Torreya californica excels, despite an evergreen canopy. The FOUR PHOTOS BELOW are drawn from site visits made to Florida Torreya's California cousin in summer 2005. 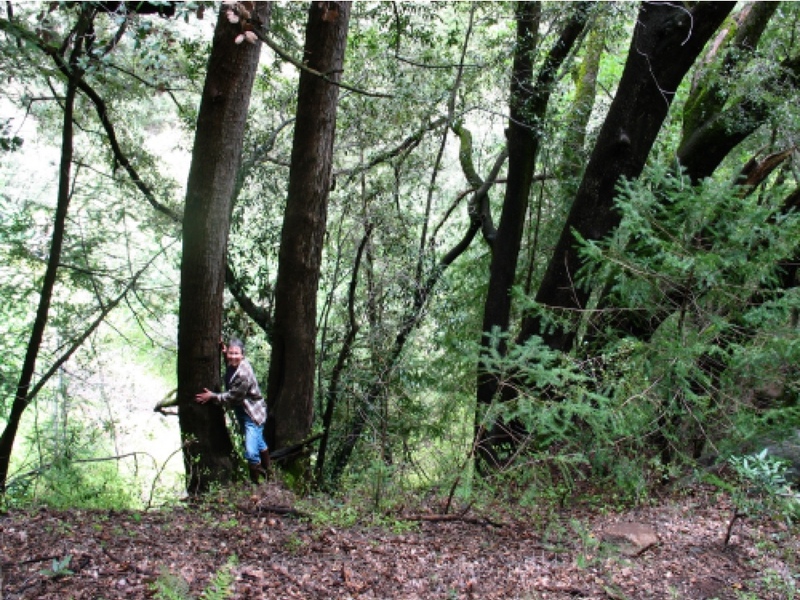 ABOVE LEFT: Connie Barlow with a double-stemmed old Torreya, with saplings also visible on this very steep slope in Sequoia Kings Canyon National Park. ABOVE RIGHT: Lee Klinger joined Connie on this site visit to the biggest grove of California Torreyas (north of Santa Cruz). BELOW: Coast Range northwest of Napa Valley. Left is an old Torreya compensating for the steep slope. Notice the leafy basal stem alongside. 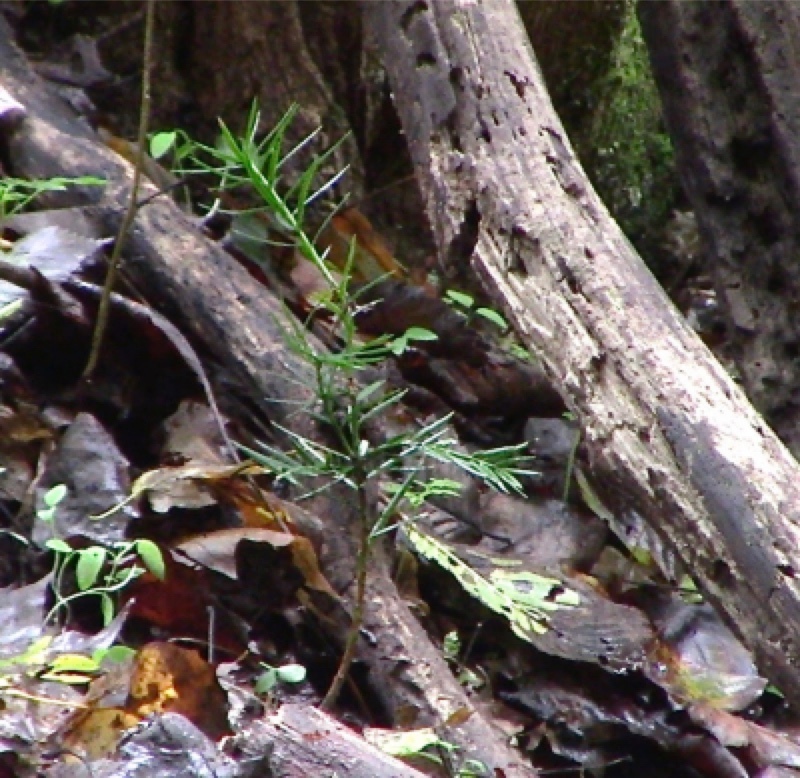 At right, this seedling is so shaded by the surrounding Redwood Trees that the camera flashed. It, too, is on a very steep slope. Background: In March 2015, we added a new "best practice" to our "Propagate, Plant, Tend" webpage: "Encouraging Symbiotic Mycorrhizal Fungi". This is a list of tree species that partnered with the same fungal root associates as does torreya. 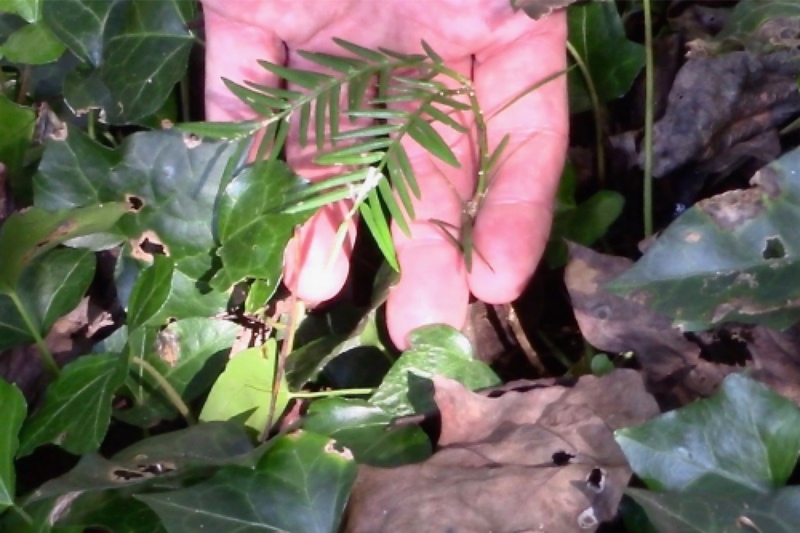 In 2018 and 2019, it became clear that "freeplanting" torreya seeds directly into forest soils nearby other subcanopy and ground-level species that associate with the same "vesicular arbuscular" (VAM) mycorrhizae would be as, if not more beneficial. 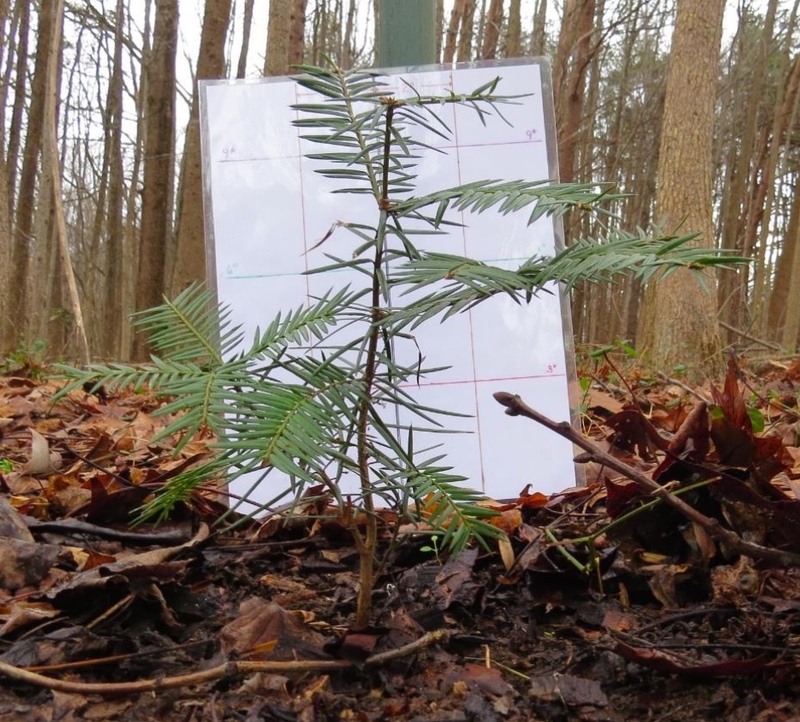 Henceforth, volunteers intending to freeplant seeds directly into forest habitats should first inventory the dominant tree, subcanopy, and ground-level plants to identify which harbor the same arbuscular ("endo") mycorrhizae as torreya. 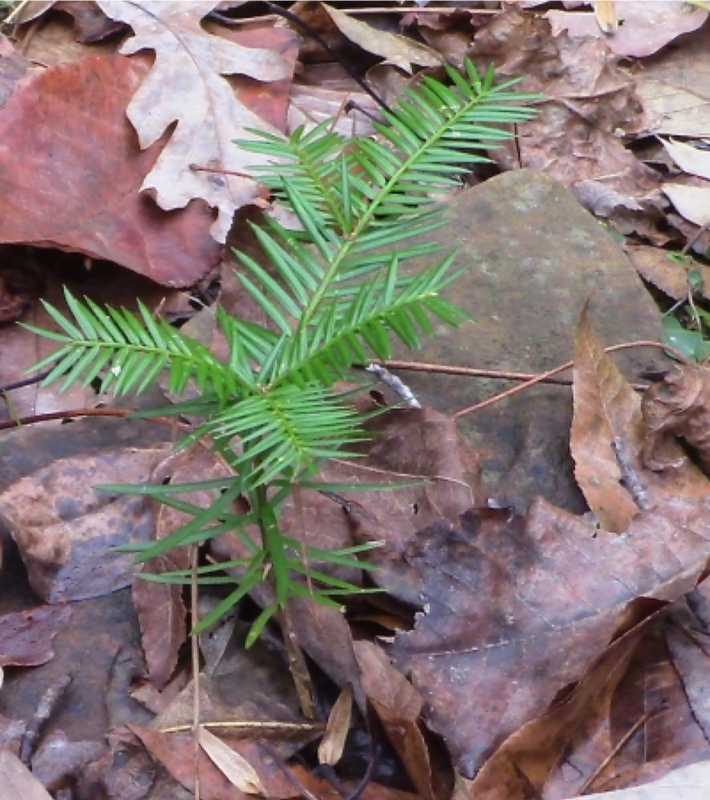 Because quite a few freeplantings of torreya seeds inadvertently happened close to CHRISTMAS FERNS, the photos and discussion below focus on this single evergreen plant species, but there are many others. 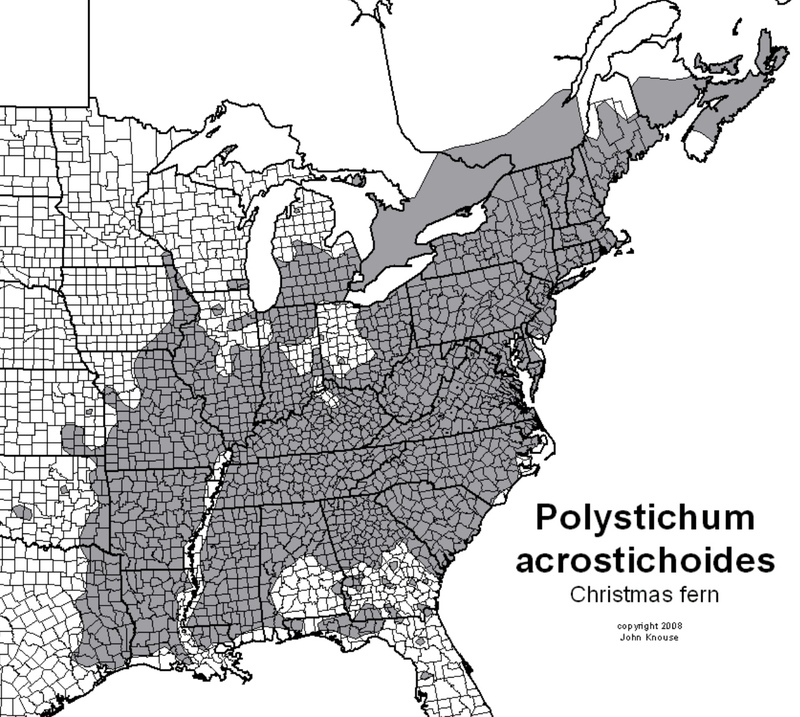 Polystichum acrostichoides, commonly denominated Christmas fern, is a perennial, evergreen fern native to eastern North America, from Nova Scotia, Canada west to Minnesota and south to Florida and eastern Texas. 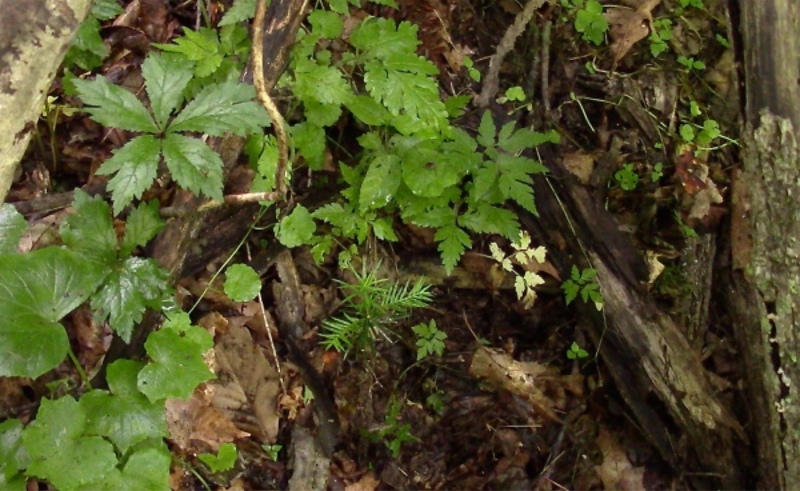 It is one of the commonest ferns in eastern North America, being found in moist and shady habitats in woodlands, rocky slopes, and stream banks. 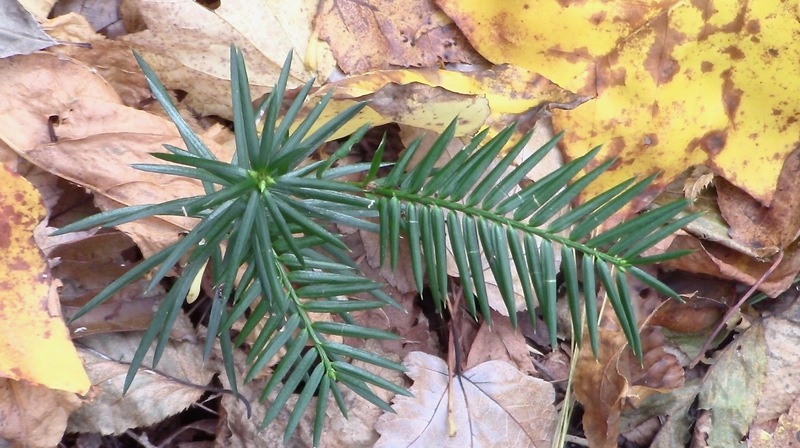 The common name derives from the evergreen fronds which are often still green at Christmas in December. PHOTO ABOVE RIGHT, January 2019: Connie Barlow examines a baby torreya four years after its seed was freeplanted in Shoal Sanctuary, west of Torreya State Park in northern Florida. 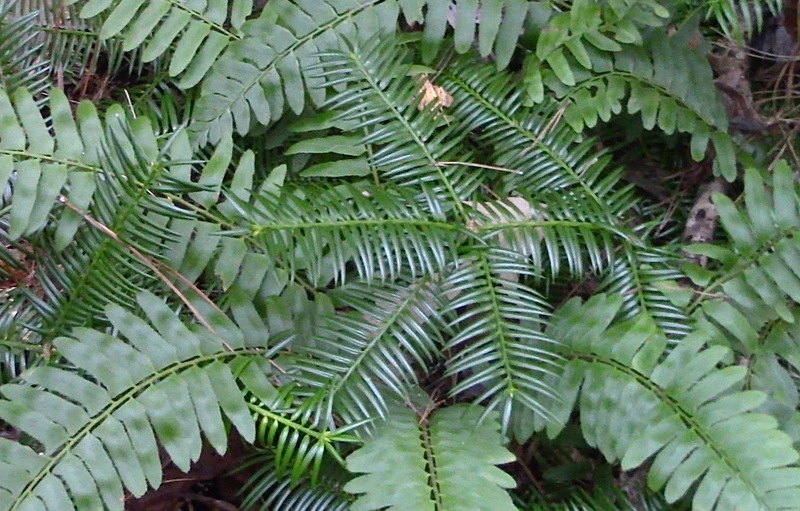 See the fronds of Christmas ferns growing on opposite sides of the torreya. 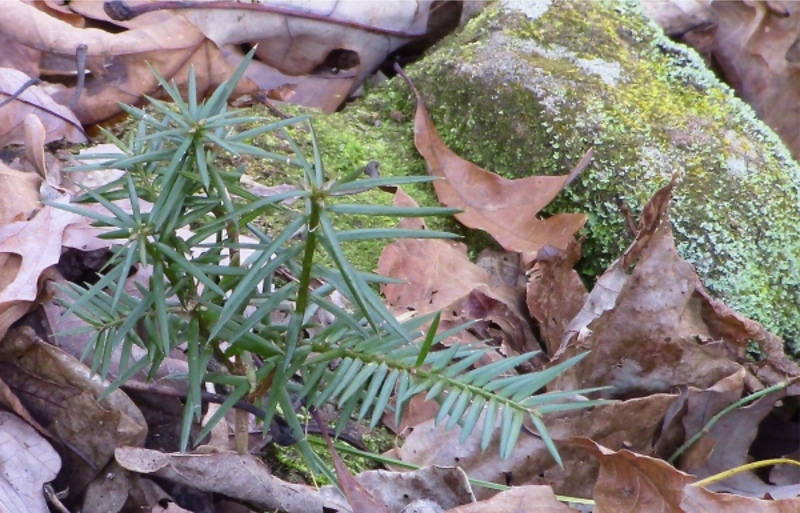 Yes, the fronds are excellent camouflage against deer herbivory, but because all nine seedlings at Shoal entirely escaped largescale herbivory  whether they had any evergreen camouflage nearby or not  this photograph is used instead to exemplify ideal placement of torreya seeds directly into soil alongside Christmas ferns. Nelson and Elaine Stover inadvertently free-planted November 2013 one of 40 seeds within a cluster of Christmas ferns. Notice the tip of an American Holly branch in the upper right corner of photo left. Holly, genus Ilex, also partners with the same arbuscular mycorrhizae. ABOVE: 2017 close-up of the same seedling. FOUR PHOTOS BELOW: Autumn 2019 Connie Barlow videoed the set of three Florida Torreya trees planted by Caroline Dormon 68 years earlier in north-central Louisiana. By far the biggest and healthiest of the three was the one downslope of the Dormon cabin. (Access the video and text via the Torreya Guardians' Louisiana Torreya webpage.) 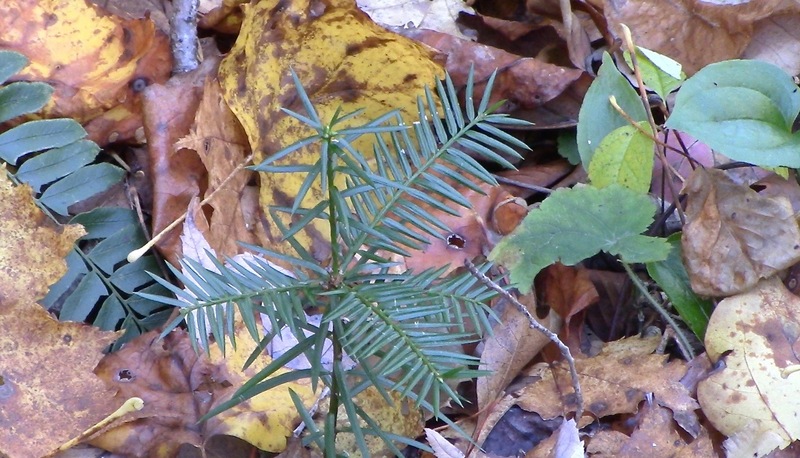 In the photo set, notice that this Torreya has a long ground-trending branch  the foliage of which intermingles with vibrantly healthy CHRISTMAS FERNS. 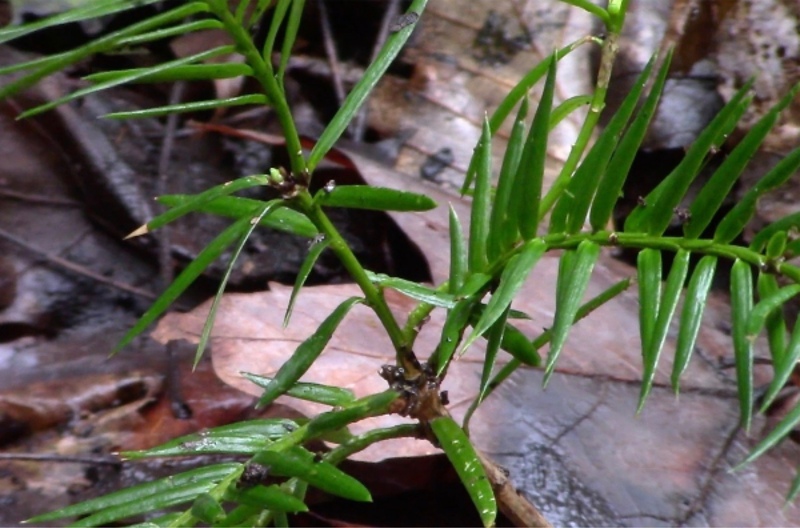 Additional study of this species cohabitation would be helpful to do determine whether the fern mycorrhizal network interpenetrates the ground-lying branch, or whether the network connects with the Torreya via the tree's own hidden, sprawling root structure. 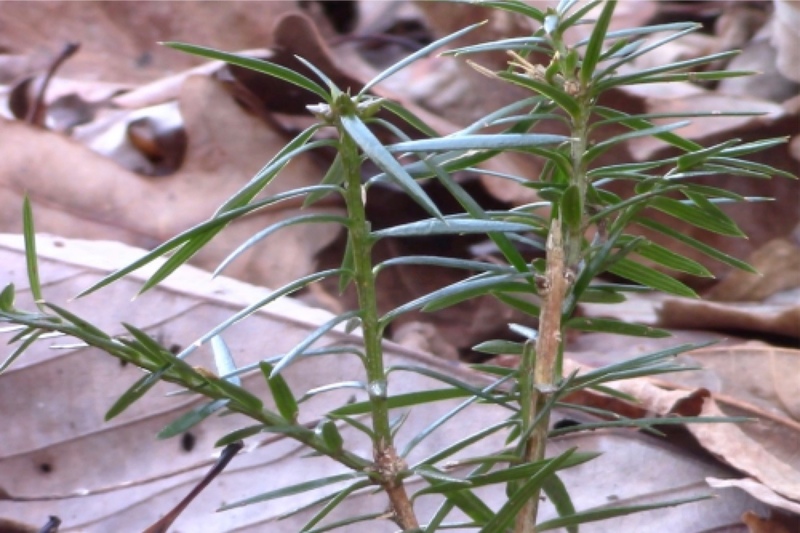 Note: POLISTICHUM ACROSTICHOIDES is a front-runner for identifying a habitat-specific, but geographically widespread and abundant, type of plant that can serve as an "indicator species" for quickly identifying the best habitats and microsites for planting Torreya into wild forests. 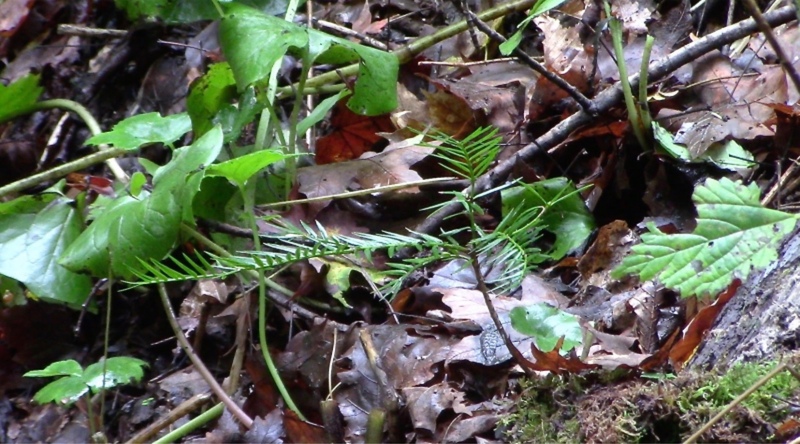 Watch a 2019 video of a successful site of "freeplanting" four years after the seeds were planted; timecode 21:40 of Video 31b entails a pictorial explanation of why Christmas Fern may be an ideal indicator species. PHOTO LEFT: April 2015 - Jack Johnston and Connie Barlow visit this oldest grove of Florida Torreya trees in April 2015. Because this grove and surrounding regrowth forest was left undisturbed for most or all of the grove's century of growth, it is the best site for studying how this tree grows and reproduces in a wild forest. The overtopping deciduous canopy creates deep summertime shade. Absence of other conifers offers full sun in the leafless months. 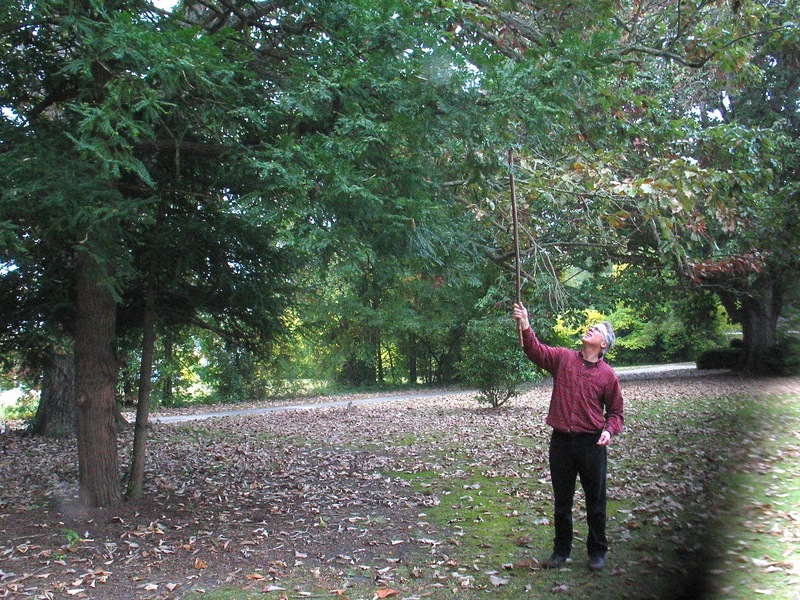 PHOTOS BELOW: Jack measures circumference of one of the largest of the seven original trees. Right: Among the offspring is a young tree on a steep little slope, 30 yards from the parent grove (and thus presumably planted naturally by a squirrel). Connie Barlow has visited this mature grove 4 times since 2004. Photos here are from two site visits: April 2015 and November 2018, with Michael Dowd as assistant. October 2015 Connie Barlow and Michael Dowd contacted Mrs. Kennedy, who was happy to have us venture onto her front lawn and harvest the still-hanging seeds  and any seedlings we found in the vicinity (as the surrounds would be mowed). 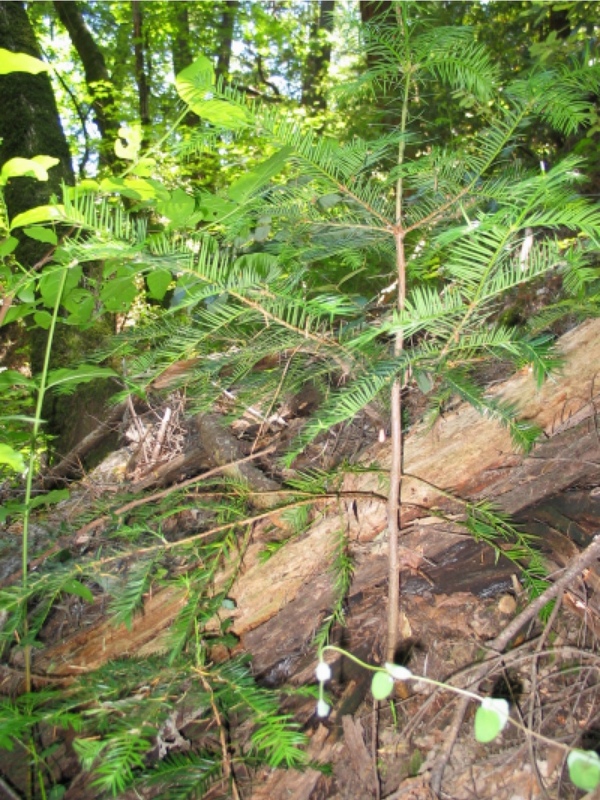 PHOTO LEFT: This specimen shows the classic growth form of a Torreya: the main stem is supplemented by two grown basal stems that may have emerged simultaneously. Even now, young leafy basals are healthy and waiting, should their services be needed in the future. PHOTOS BELOW: Connie and Michael collected fallen seeds and dug up six seedlings October 2013. 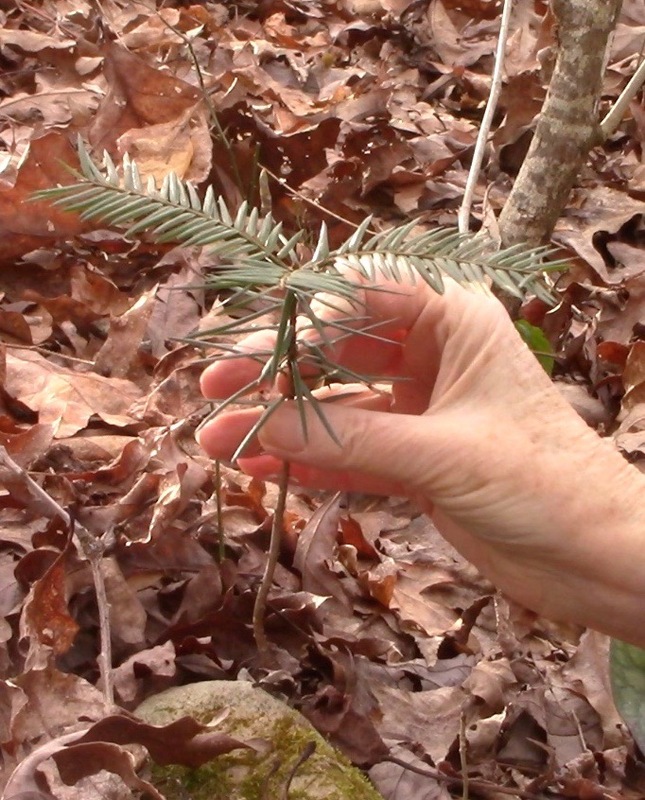 The seedlings they found were all beneath the parent Torreya or its neighboring Southern Magnolia or Chestnut Oak. 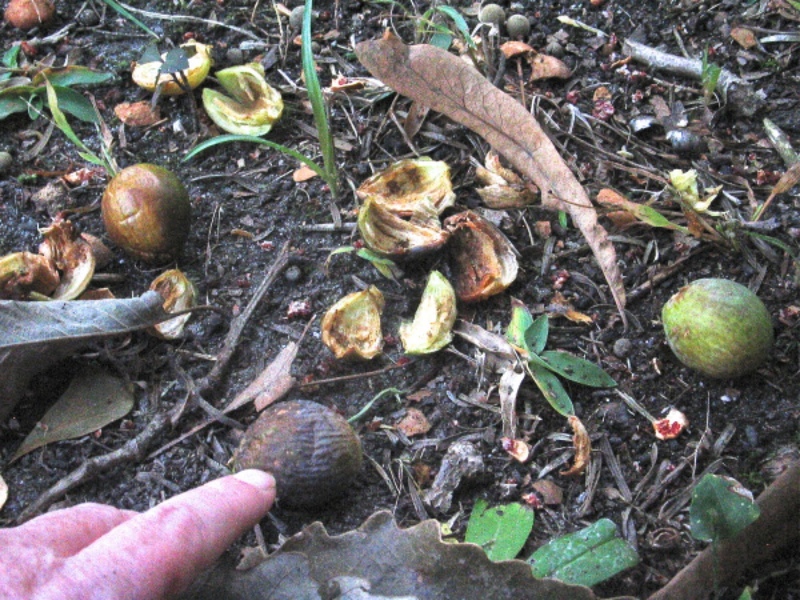 Photo below right shows a one-year-growth seedling near a fallen fruiting body of the magnolia. They delivered the six seedlings to Jeff Morris of Spencer NC. In 2014 Jeff made a second seed harvest at the Kennedy home and observed additional seedlings in distant flower beds. 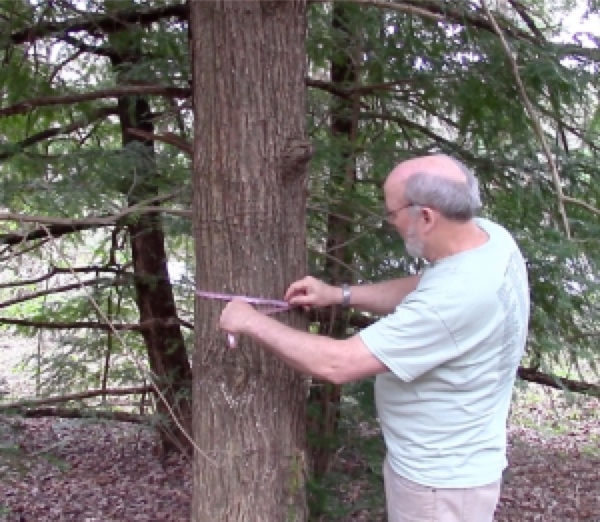 He also noticed that a 6-foot-tall basal sprout had grown from the stump of an additional original torreya planting that had blown down in the late 90s. Whether or not that basal is a continuing pollen source is unknown; nonetheless, the remaining original tree still produces viable seeds. Jeff wrote, "There is at least one additional volunteer about 3-ft-tall along the driveway, bordering a neighbor's property. Finally, we learned that there used to be two additional mature Torreya taxifolia trees, larger than either of the Kennedy's pair, about a block away." 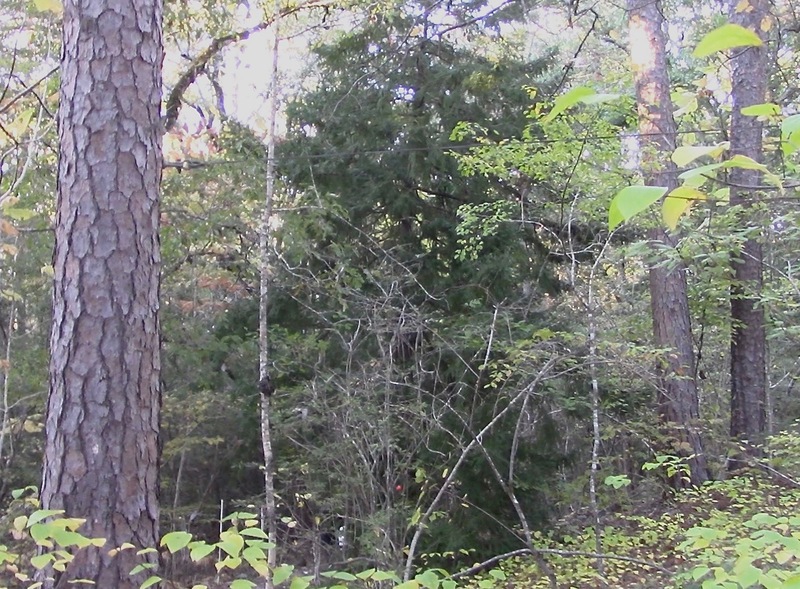 The Caroline Dormon Nature Preserve is 120 acres, at the northern tip of Natchitoches Parish. Three generations of Johnsons have been the stewards: Richard, Rick, and David. 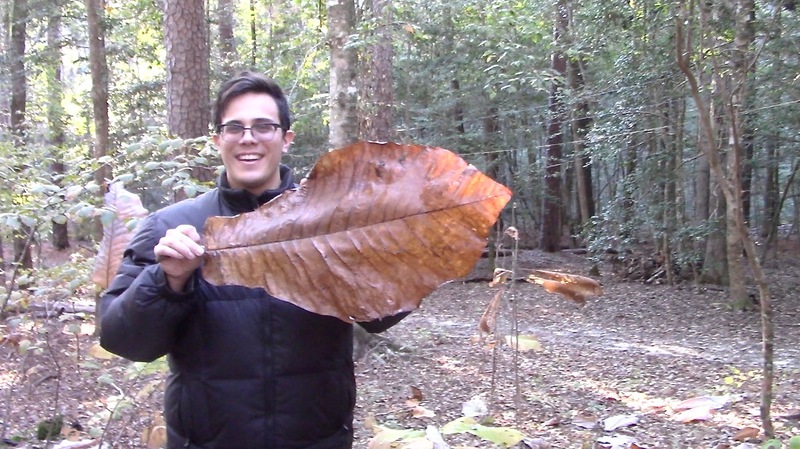 David is holding the leaf of a Big-Leaf Magnolia in the photo at bottom. November 2018, Torreya Guardians Clint Bancroft and Connie Barlow visited the preserve and were guided by the Johnson family. This year, 3 of the 4 seeds were still hanging. A fruit-collecting device on a large pole enabled us to collect those ripe seeds. The inset of top photo shows one seed. All 4 seeds were donated to Torreya Guardians. The Johnsons report that, thus far, all seedlings have been found directly beneath the canopy, so squirrels are not distributing them. Most of the seven to ten seedlings have been outplanted amidst the young grove of Bigleaf Magnolia about 30 feet beyond the Torreya's canopy (visible in bottom photo). Two characteristics of Bigleaf Magnolia make it a good companion: it is deciduous and it supports the same class of mycorrhizal fungal symbionts as torreya does.